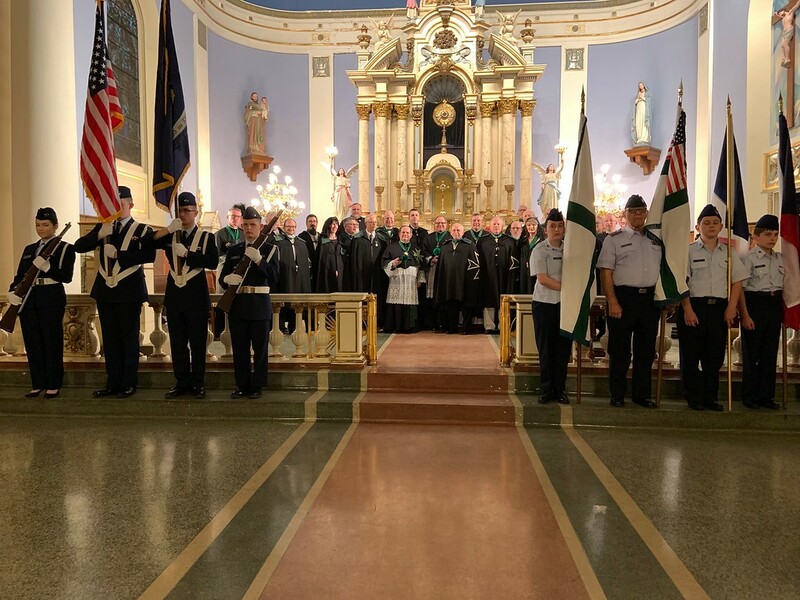 The Grand Priory of the USA recently held its annual Investiture in New Orleans in the splendid church of St Mary, the Chapel of the Old Ursuline Convent built in 1845. Cadetes formed an honour guard for the procession as new members were admitted and promotions awarded. Sad news that Fr Milan Norbert Badal died yesterday aged just 62. A Chaplain to the Order, he was also personal secretary to our Chaplain General, the Cardinal Archbishop of Prague, Dominika Duka, assisting particularly with media related issues. Between 2003 and 2009, Milan Badal served as vice-president of the Czech television Council. Between 2015 and 2016 he was deputy chairman Of the Czech Radio Council. From 1996 to 2003 he served as editor-In-chief of the Catholic weekly newspaper. He was Born in the town of Opočno in eastern Bohemia, 15. August 1956. He graduated from the philosophical Faculty of Charles University in Prague. He was parish priest to a parish on the outskirts of Prague at Hostivice. He was a writer, publishing mainly with Sursum Publishing and was a contributor to the Christian Internet magazine Christnet.cz. He also published a recipe book of traditional Czech dishes. The Grand Prior of Great Britain, His Excellency Anthony Dickinson, cordially invites all members of the noble Order, Companions, their families and guests to meet in the County of Lancashire on 12th and 13th July 2019 for the Annual Investiture of new members and the granting of promotions. Guests are most welcome to attend any and all events. Non-members are most welcome to attend. Please contact any member of the Grand Priory. On this the twenty-first day of January, on the anniversary of the execution of King Louis XVI, His Royal Highness Prince Henri, Count of Paris, Duke of France, Head of the Royal House of France, surrendered his soul to God. Count of Paris solemnly resumed protection of the Military and Hospital Order of Saint-Lazare of Jerusalem. This protection has been ensured by all the Heads of the Royal House of France from King Philip IV le Bel to King Louis XVIII. where Divine mercy and benevolence reign. 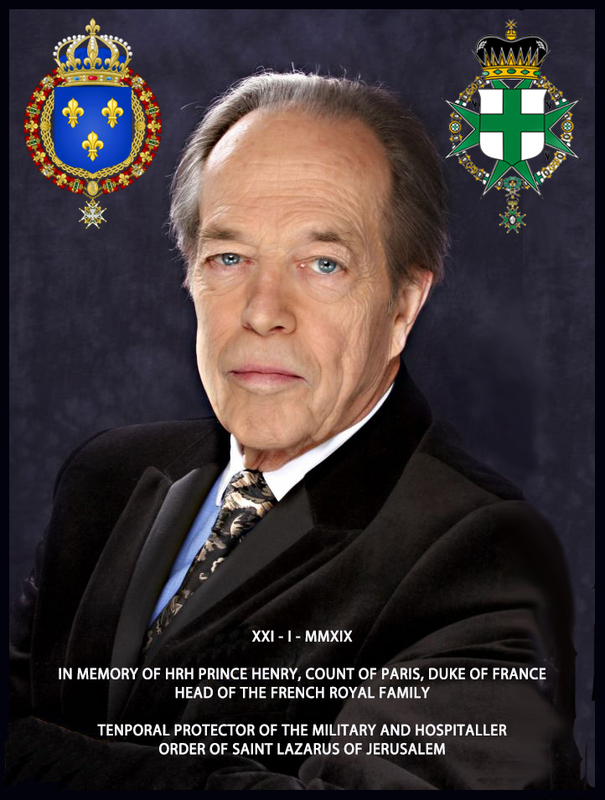 Royal Family and pray to the Lord that the Soul of Monseigneur the Count of Paris finds its eternal repose in Paradise, remaining in our memories. We ask God to receive him to Himself along with all the Kings of France who preceded him. Lazarus, the friend of Jesus, the brother of Martha and Mary, was the one of whom the Jews said, “See how much he loved him.” In their sight Jesus raised his friend Lazarus from the dead. Legends abound about the life of Lazarus after the death and resurrection of Jesus. Another story is that despite being put into a leaking boat by the Jews at Jaffa, he, his sisters and others landed safely in Cyprus. There he died peacefully after serving as bishop for 30 years. A church was built in his honor in Constantinople and some of his reputed relics were transferred there in 890. A Western legend has the oarless boat arriving in Gaul. There he was bishop of Marseilles, was martyred after making a number of converts and was buried in a cave. His relics were transferred to the new cathedral in Autumn in 1146. It is certain there was early devotion to the saint. Around the year 390, the pilgrim lady Etheria talks of the procession that took place on the Saturday before Palm Sunday at the tomb where Lazarus had been raised from the dead. In the West, Passion Sunday was called Dominica de Lazaro, and Augustine tells us that in Africa the Gospel of the raising of Lazarus was read at the office of Palm Sunday. 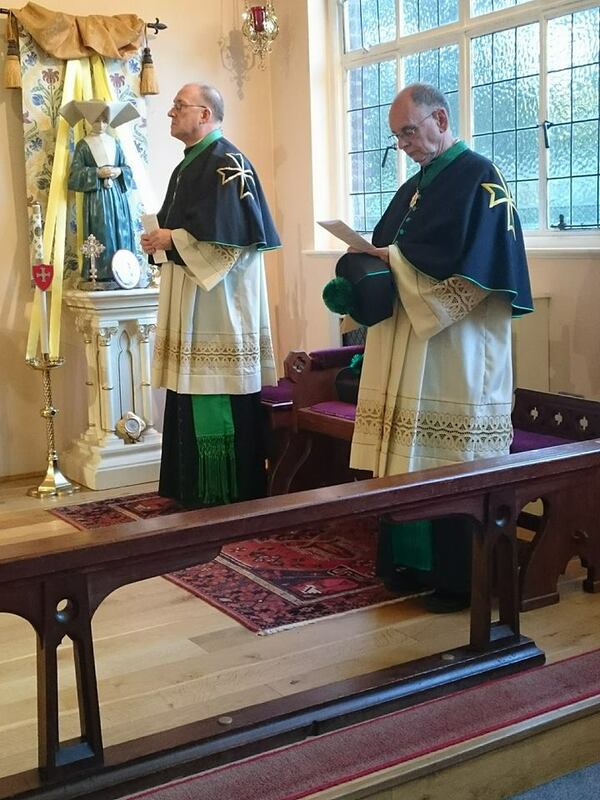 Chaplain General of the Grand Priory of Great Britain, Fr Simon Henry, paid a visit to the Catholic Chaplaincy at the University of Bristol, attending a lovely sung Mass in the Chaplaincy Chapel for the Feast of the Immaculate Conception. 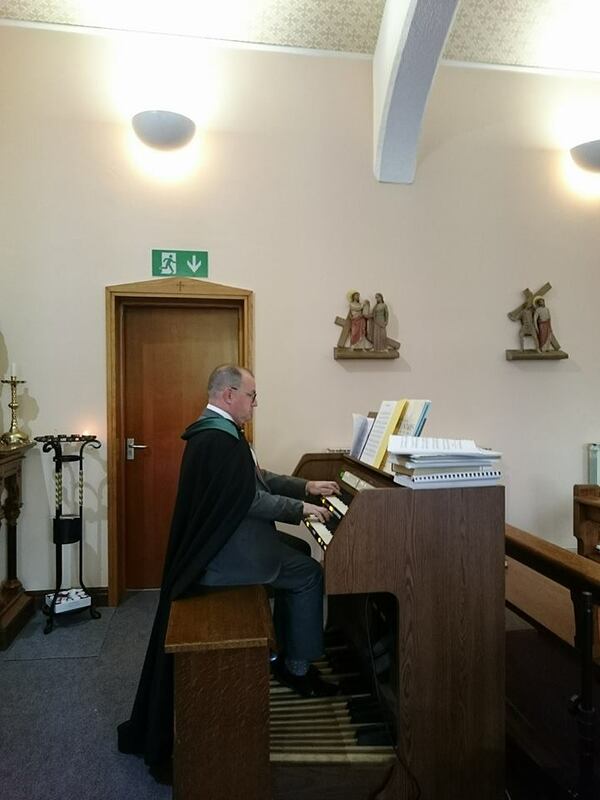 The invitation came from University Chaplain Fr Rupert Allen. Raising the Order's profile, particularly among young people is one of the aims of newly installed Grand Prior of Great Britain, HE Chev. Anthony Dickinson, to make sure that the Order will have a flourishing future in Great Britain. 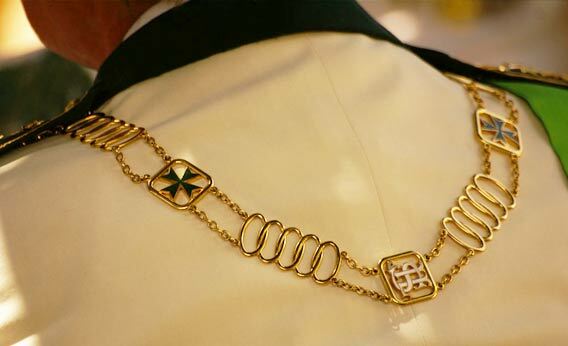 to prepare new members for reception into the Order. 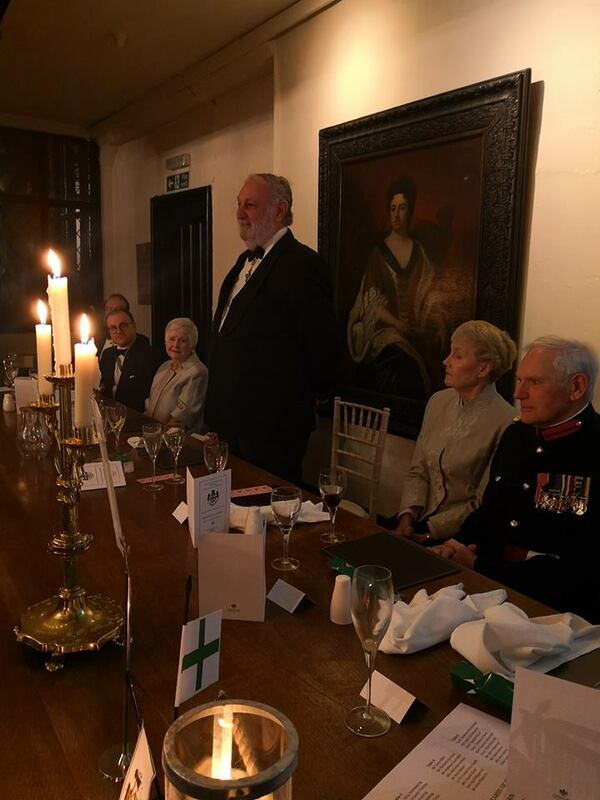 All were honoured once again with the presence of Grand Master of the Order, HE Jan Count Dobrzenský z Dobrzenicz and also, as the representative of Her Majesty the Queen in the County, the Deputy Lord Lieutenant of Lancashire, Col. Alan Jolley and his wife, Mary. After Vigil Service, the postulants hear the Marshal instruct them as soldiers of Christ, our unseen Captain. OUR BATTLE is with the sword. and against the temptations of the prince of darkness. This battle is under the sign of the Cross. May no other battle divide mankind. 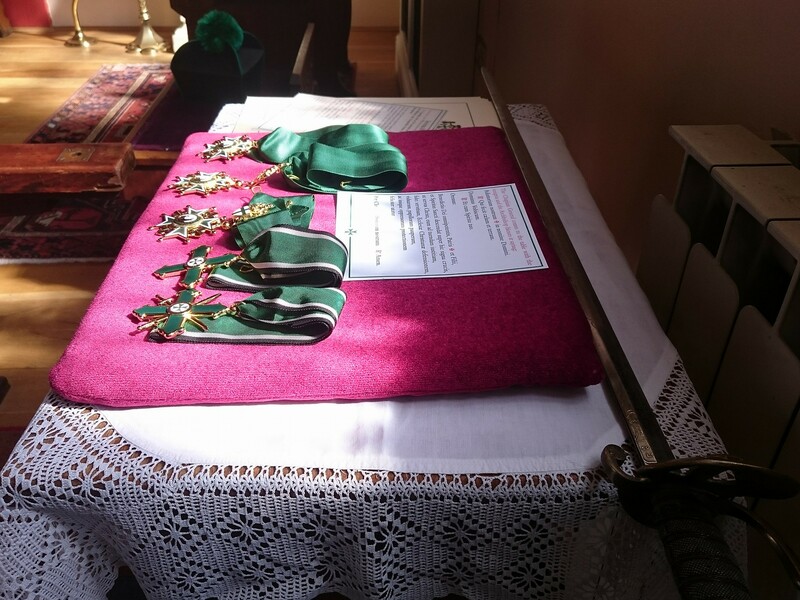 Postulants, behold the sword! Remember always its double significance of both Cross and Arms. Use it to defend what is right and good, and to fight what is wrong and evil, to the greater glory of God, the benefit of those in need, the honour of the Order, and the furthering of your own salvation! 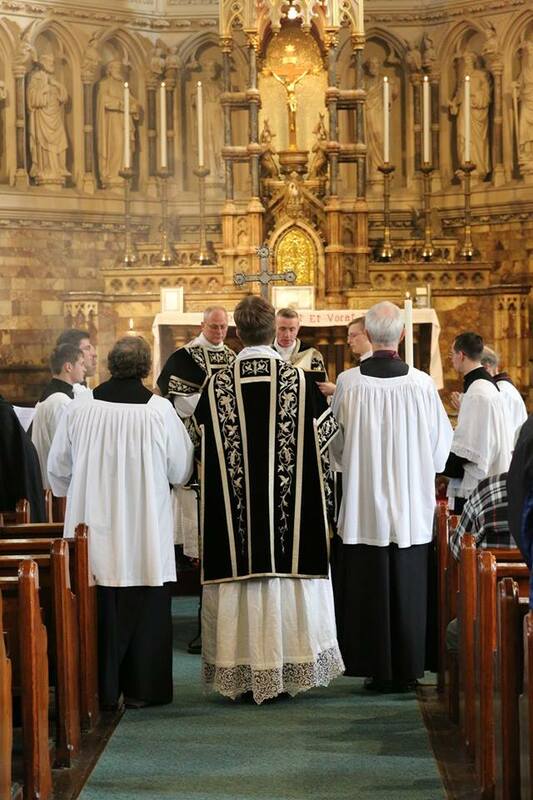 An invitation to annual Requiem Mass open to all. and this year, the day before the 100th Anniversary of the ending of the First World War, also for those who have fallen in war. 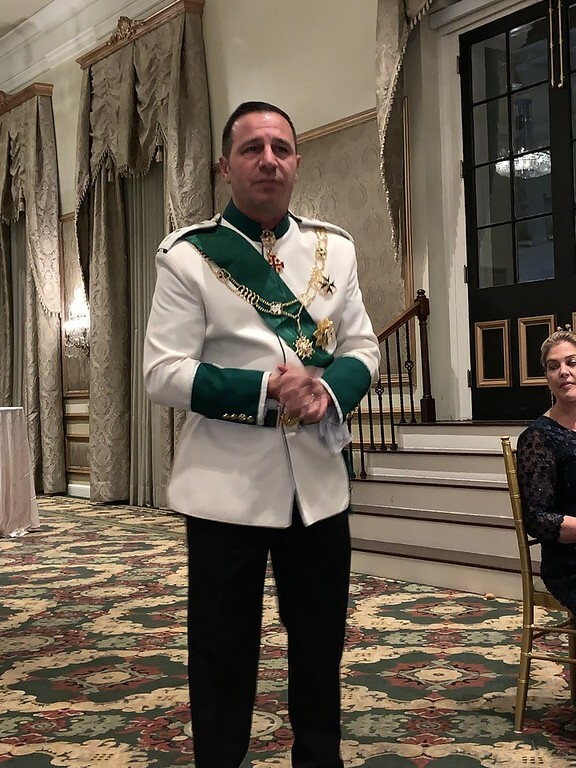 On Saturday, October 13, 2018, the annual meeting of the Governing Council Military Order of the Military and Hospitaller Order of the St. Lazarus of Jerusalem was held at the Adalbert Hotel in the premises of the Břevnov Monastery. 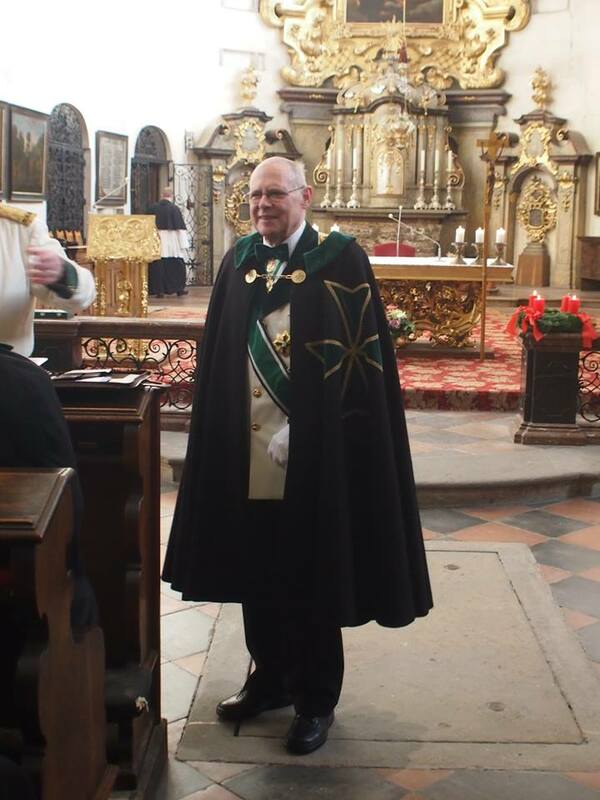 The Grand Master of the Order Jan Count Dobrzenský from Dobrzenice and other top officials of the Order took part. The delegations of the national jurisdictions of the order from Belgium, Montenegro, the Czech Republic, France, Italy, Hungary, Monaco, the United States of America, Switzerland and Great Britain participated in the meeting. 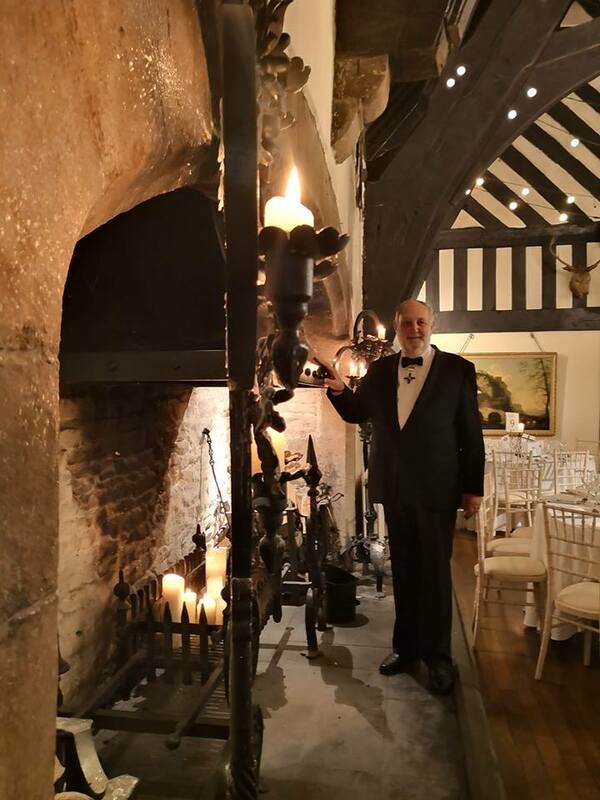 The meeting was chaired by Martin Thacker, Baron of Fetternear, Vice-President of the Governing Council. At the beginning, the greeting of the Chaplain General of the Order, Cardinal Duka the Archbishop of Prague, was read. The most important part of the meeting was devoted to the evaluation of the charity projects of the Order and the search for ways to get more funds for their implementation. It also talked about the strategy of acquiring new quality members of the Order and volunteers for orderly and charitable work. In the second part of the program, the individual national jurisdictions presented their activities. 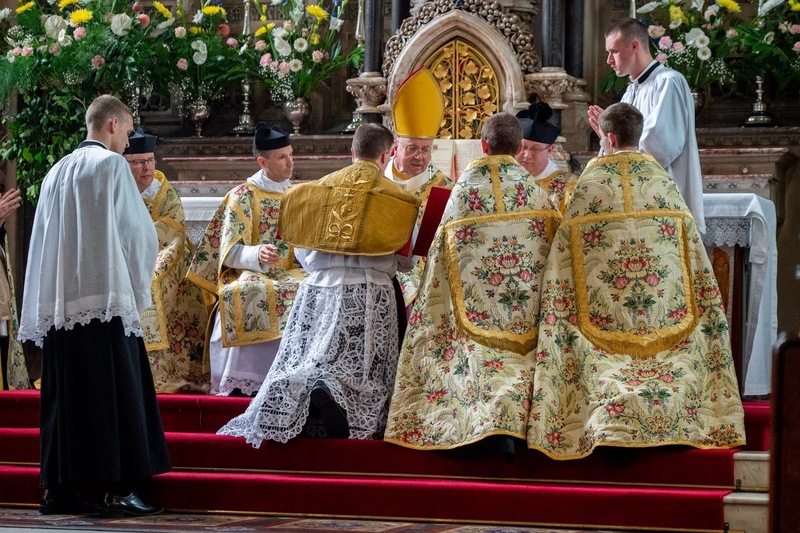 The Grand Priory of Poland informed about the preparation of the Grand General Chapter of the Order to be held in September 2019 in Warsaw. Approximately 250 representatives of each grand priory are expected to attend. 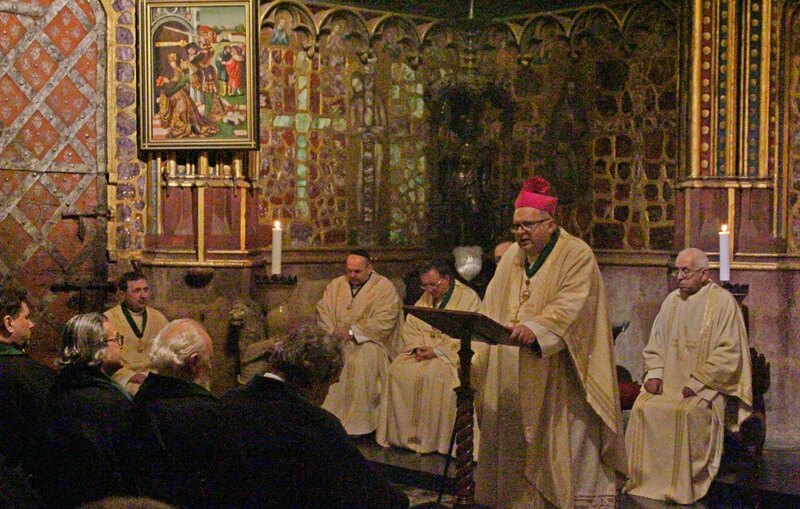 The Prague Session of the Governing Council was organized by the Grand Priory of Bohemia. With the participation of His Excellence Aldo Amati, the Ambassador of the Italian Republic in the Czech republic, representatives of the Czech and Italian armies, the mayor of the town of Milovice and members of the Grand Priory of Bohemia of the Military and the Hospitaller Order of the St. Lazarus of Jerusalem, a commemorative act for the dead prisoners of war was held in Milovice (Czech republic). The act took place at the Italian Military Cemetery. It is located southwest of the town and was formed during the First World War, when a camp for Italian and Russian prisoners was held in Milovice. At that time, nearly 20 000 men were interned, many of whom died as a result of typhus epidemics and hunger. There are 5170 Italian, 521 Russian and 51 Serbian soldiers buried in the cemetery. These prisoners also took care of the prelate of the Order of St. Lazara, Msgre. ThDr. Antonin Count Bořek-Dohalský from Dohalice. 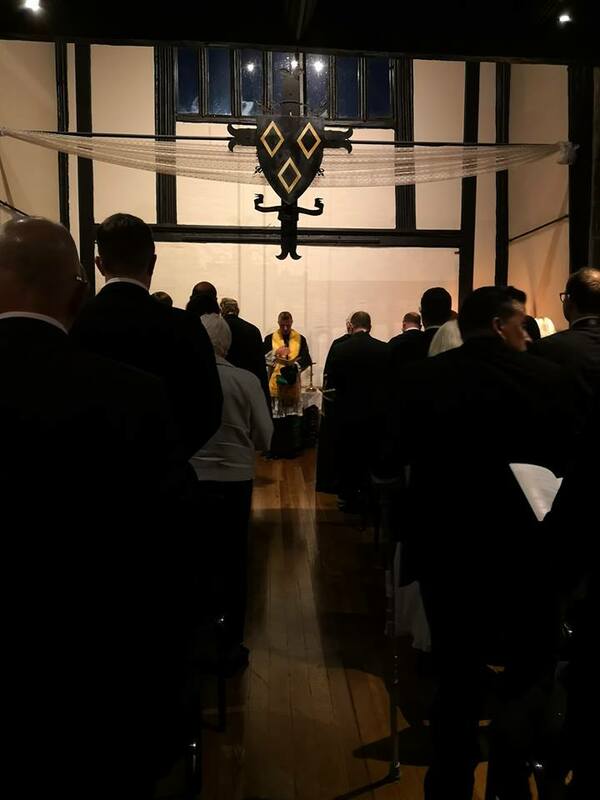 On the feast of St. Wenceslas in the medieval hall and chapel of Salmesbury Hall, Preston in Lancashire, a solemn vigil for postulants and a gala charity dinner was held by the Grand Priory of Great Britain, hosted by the Grand Prior Anthony Dickinson, KLJ, CMLJ. The Grand Master, Jan count Dobrzenský z Dobrzenicz, was present and the Deputy Lieutenant of Lancashire Col Alan Jolley MBE OStJ, who is Her Majesty Queen Elizabeth II 's deputy representative in the County, accepted a cheque for BLESMA the charity which helps limbless ex service personnel. Chancellor of the Grand Priory of Poland Jan Szmyd as well as Bailli of the Grand Priory of Bohemia Ondrej Vanke. In a beautiful Renaissance castle chapel in Krasiczyn on the eve, that is on Friday, June 8 a preparation for the Investiture was done. During the ceremony three people were admitted as postulants and three others took vows before the Investiture, while all the members of the order renewed their vows. experiences, hold conversations and it also allowed to experience the sense of unity in the activities carried out by the members. In the afternoon in front of the Carmelite church of St. Teresa appeared people in their characteristic mantles with green crosses and women with lace mantillas on their heads; and the religious greeting: "Atavis et Armis!" could be heard. 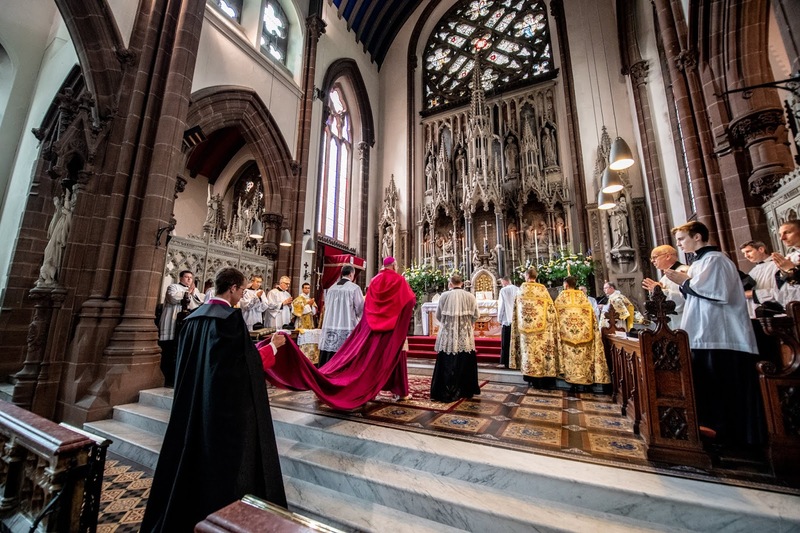 A solemn Holy Mass of Investiture was held there. The musical setting was provided by the Archdiocesan Magnificat Choir. 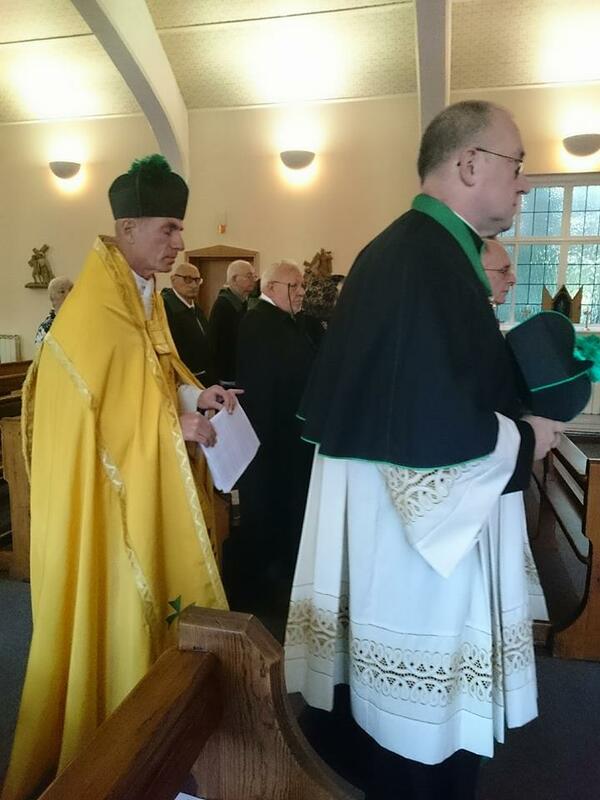 The concelebration was presided over by Archbishop Senior Jozef Michalik who also gave his homily. During the Eucharist three postulants - a sister and two brothers - received the mantles of the order, thus becoming members of the order. Promotions to higher ranks and decorations were given as well. Guests and representatives of both Commandories also visited the Arboretum and the Department of Physiography in Bolestraszyce and met with the volunteers associated with the Order. Meeting with the Archbishop Józef Michalik and President of Przemysl Robert Choma were significant moments of that event. The Chapter General and Ceremonies were attended by the representatives of the Kujawsko-Pomorska and Podkarpacka Commanderies as well as by the Delegation from Zamość. 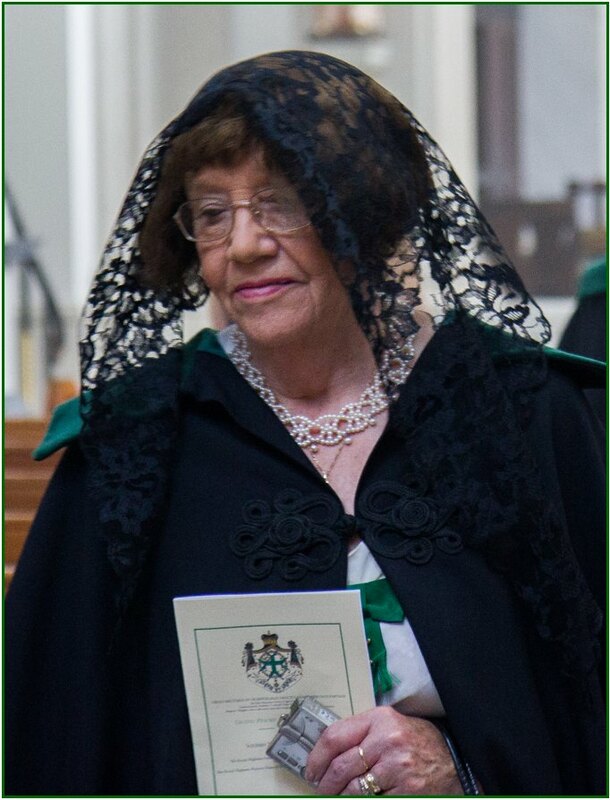 The memorial service and cremation of the late Dame Elizabeth Douglas DStLJ was held in Clydebank Scotland this morning. Libby had been ill for a while and she passed away on 23 May 2018. Friends and relatives gathered for the simple service. Hungarian President János Áder awarded our Grand Chaplain General Dominic Cardinal Duka the State Medal of the Cross with a Star of the Order of Merit of Hungary. 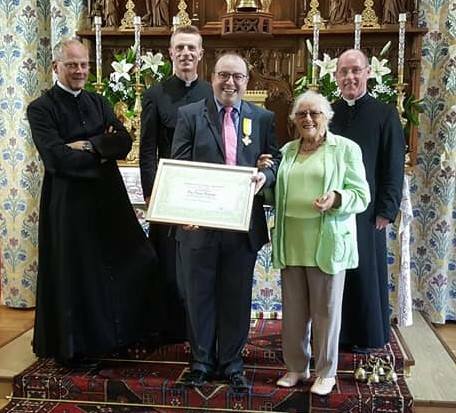 This is an important award to the Archbishop of Prague . The ceremony was attended by the President of the Hungarian Parliament László Kövér, Deputy Prime Minister Zsolt Semjén and Cardinal Péter Erdő, Archbishop of Ostrihom-Budapest. Deputy Prime Minister Semjen in a speech praised Cardinal Duka as a devoted friend of Hungary. The President of the Hungarian Parliament, László Kövér, then personally presented the medal in the Parliament building in Budapest on the 23 rd May. 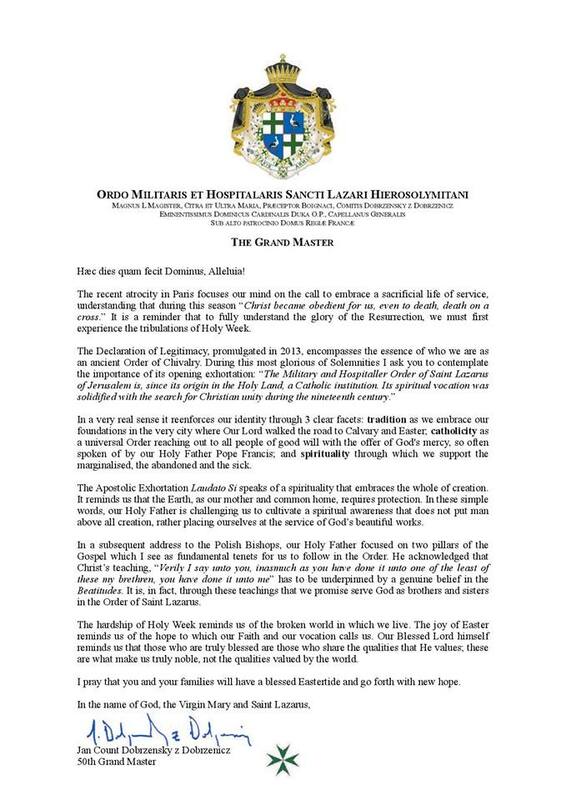 The Military and Hospitaller Order of St Lazarus of Jerusalem congratulates our Grand Chaplain General on this prestigous bestowal of recognition. On the 12th of May in the Old Town Square in Prague, there was a meeting of more than two hundred followers of the renewal of the Marian column, a cultural monument of European significance and the first Baroque statue in Bohemia. The Column was pulled by the street crowd as an alleged symbol of the monarchy on 3 November 1918 in a vandalistic manner. The Grand Priory of Bohemia has been supporting the rebuilding of the column for many years. On the Old Town Square, the pilgrims on the Old Town Square drew three and a half tons of block, one of the stones, which should be part of the architecture of the future Marian column. The restoration of the monument has a valid territorial decision, the architecture, the pillar and the statue of Virgin Mary have just been finished after 27 years of sculpture and stonework, and the implementers are ready to be installed. 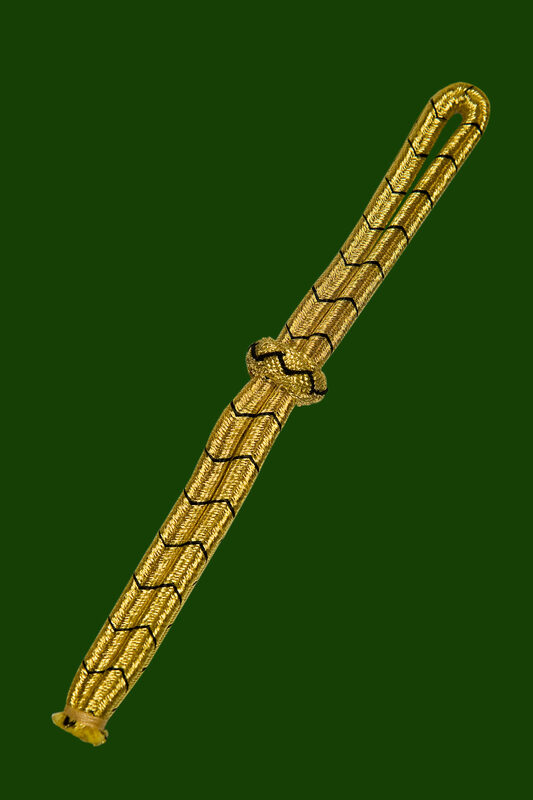 The beginning of the construction is prevented only by deliberate administrative delays by the opponents of the column. 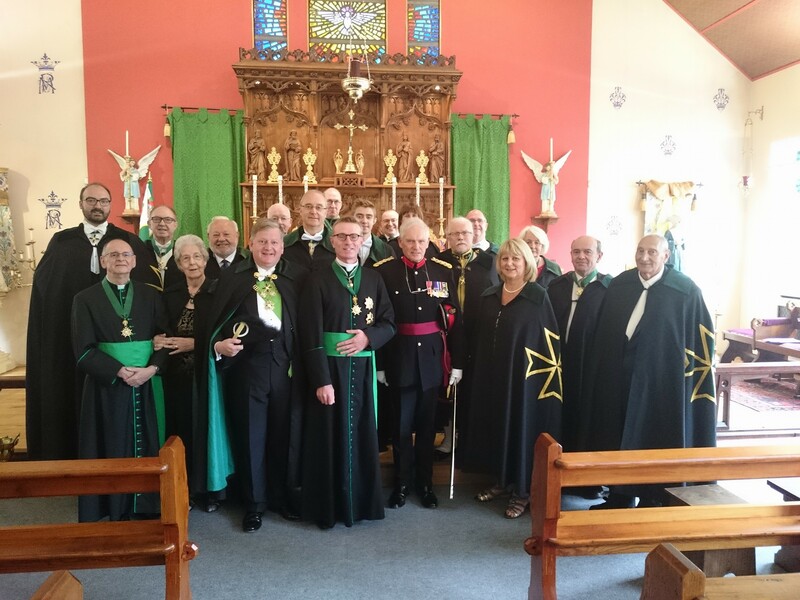 In cooperation with the Grand Priory of Bohemia, the event "Audience at the Emperor Charles" took place traditionally in the town of Brandys nad Labem - Stara Boleslav (Czech republic), where this last monarch of the Habsburg monarchy lived. Emperor Charles was beatified by Pope John Paul II. Part of the program was a show of historical military units and the Holy Mass in the Basilica of St. Wenceslas. Honorary guests were Archduke Georg Habsburg-Lothringen and Archduchess Gabriela Habsburg-Lothringen, the grandchildren of Blessed Charles. "He will enjoy my full confidence, protection and respect. 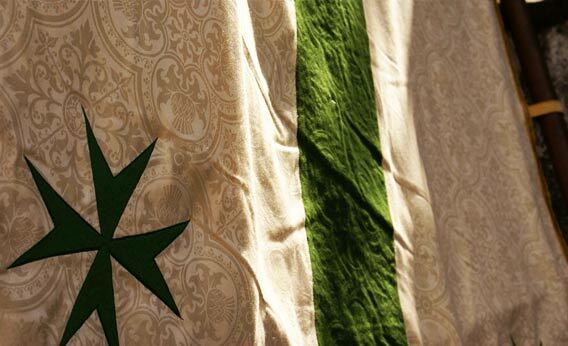 Success within the Order has been based upon unity, fraternal respect and Christian love. As members in Great Britain it is my wish that you embrace and support the leadership of your new Grand Prior and assist him in this challenging vocation. I commend this mission to you." The Grand Prior outlined a strategic plan for Grand Priory of Great Britain to move forward with some bold new initiatives and some welcome encouragement for our existing and prospective new members - already petitioning to become our brothers and sisters at our Investiture later this year on 28th and 29th September. 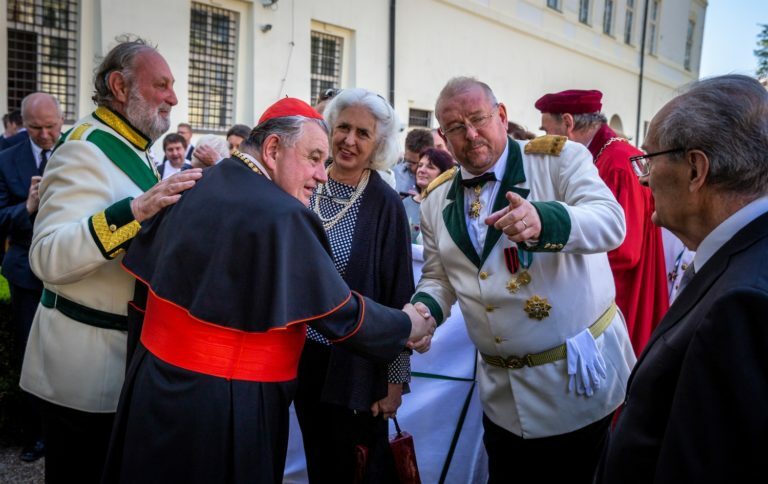 On Thursday, April 26th, the Archbishop of Prague Dominik Cardinal Duka OP, celebrated his 75th birthday. He is also the General Chaplain of the Military and Hospital Order of St. Lazarus of Jerusalem. 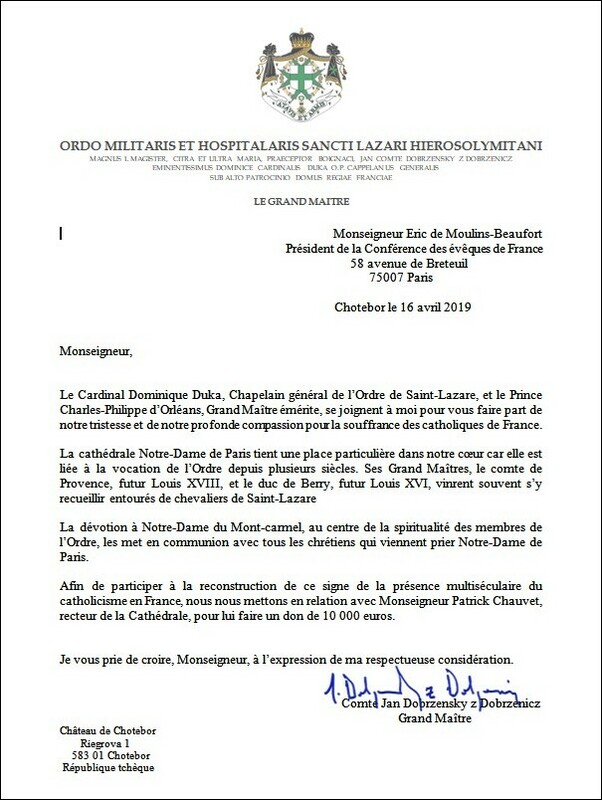 The 50th Grand Master of the Order Jan Count Dobrzensky z Dobrzenicz GCLJ-J, and some members of the Grand Priory of Bohemia had the opportunity to congratulate their General Chaplain for his jubilee on Saturday, April 21, in the garden of the Archbishop's Palace. 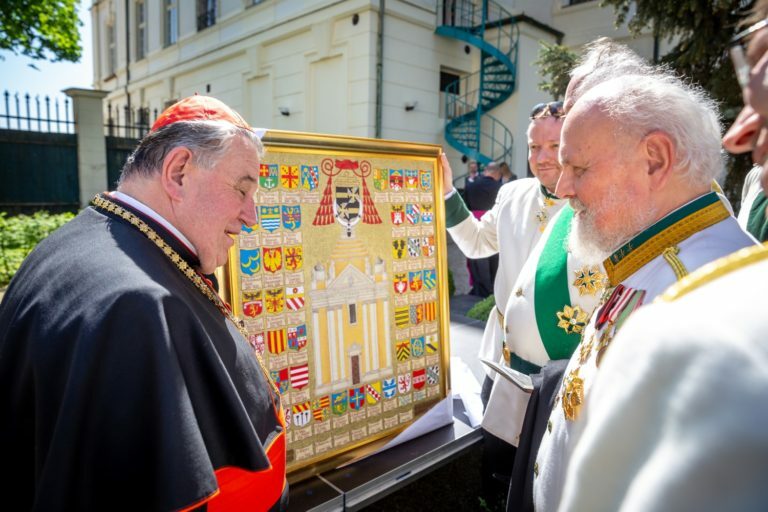 They thanked him for his help and cooperation to the order, and as a gift of the Grand Priory of Bohemia, they handed him a painting by the artist Zdirad Čech, EOSSP, KCLJ. The painting is of the church of St. Marcelina and Peter in Rome, the titular church of the cardinal, together with his coat of arms and the arms of the cardinals who preceded him in this church. 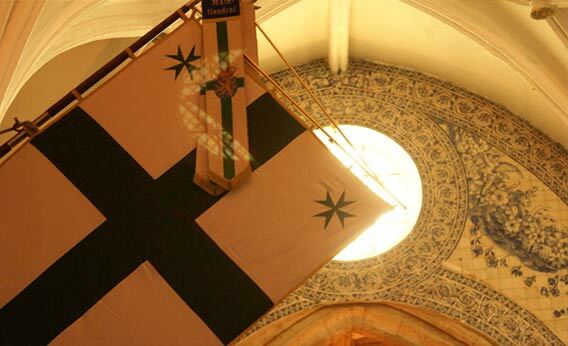 Members of the Military and Hospitaller Order of St Lazarus of Jerusalem wish the General Chaplain of the Order a very happy birthday,God's blessings and the gifts of the Holy Spirit, necessary for the performance of his demanding pastoral profession. 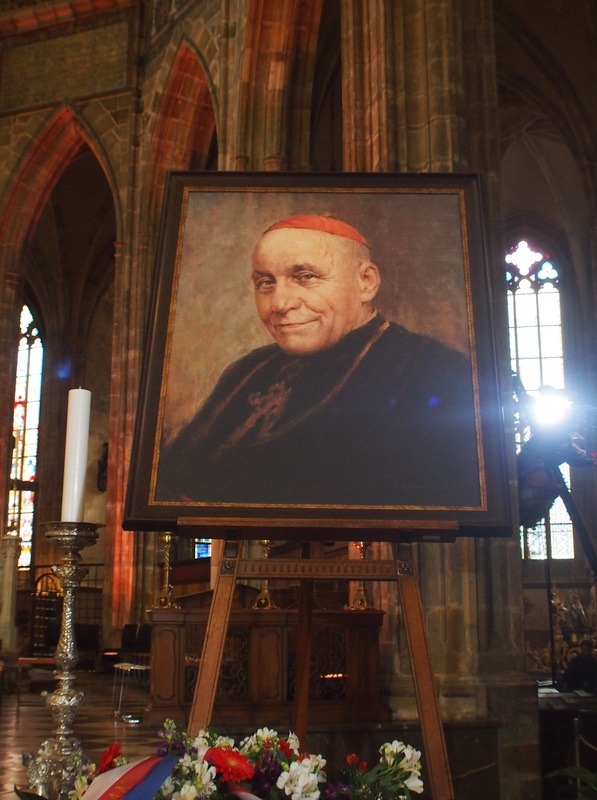 Grand Master of the Order and members of the Grand Priory of Bohemia took part in the solemn return of the remains of Cardinal Josef Beran. Cardinal Josef Beran was imprisoned by the Nazi and Communist regimes. After his travel to Second Vatican Council, the Communist government in Czechoslovakia refused his return to homeland. During the festive Mass, served by His Eminence Dominik Cardinal Duka OP, GCLJ, the remains were exhibited at the The Metropolitan Cathedral of Saints Vitus, Wenceslaus and Adalbert and then stored in the crypt. Beran's Beatitude process is ongoing. His Eminence Josef Beran, Servant of God (29 December 1888 – 17 May 1969) was a Czech Roman Catholic prelate who served as the Archbishop of Prague from 1946 until his death and was elevated into the cardinalate in 1965. Beran was imprisoned in the Dachau concentration camp during World War II after the Nazis had targeted him for "subversive and dangerous" behavior where he almost died in 1943 due to disease. He was freed in 1945 upon Allied liberation and Pope Pius XII nominated him to head the Prague archdiocese. But the introduction of the communist regime saw him imprisoned and placed under house arrest. His release in 1963 came with the condition that he could not perform his episcopal duties and he was later exiled to Rome in 1965 as part of a coordinated deal between the Church and the national government. His cause for canonization opened in 1998 and he became titled as a Servant of God. 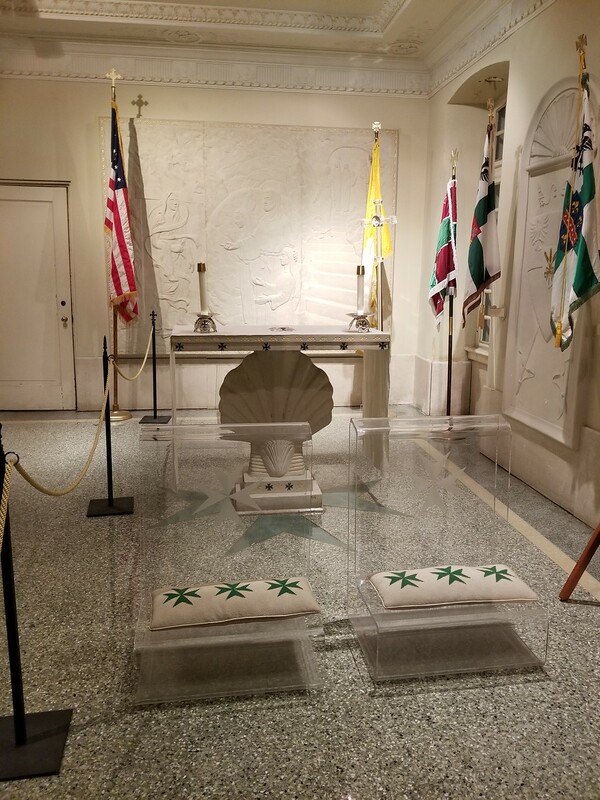 He was granted the rare honor of being buried in Saint Peter's Basilica upon his death and remained the sole Czech national to be buried there until 2018 when his remains were transferred back to his native homeland for internment in the Saint Vitus Cathedral. Hæc dies quam fecit Dominus, Alleluia! The recent atrocity in Paris focuses our mind on the call to embrace a sacrificial life of service, understanding that during this season “Christ became obedient for us, even to death, death on a cross.” It is a reminder that to fully understand the glory of the Resurrection, we must first experience the tribulations of Holy Week. In a very real sense it re-enforces our identity through 3 clear facets: Tradition as we embrace our foundations in the very city where Our Lord walked the road to Calvary and Easter; Catholicity as a universal Order reaching out to all people of good will with the offer of God's mercy, so often spoken of by our Holy Father Pope Francis; and Spirituality through which we support the marginalised, the abandoned and the sick. The Apostolic Exhortation Laudato Si speaks of a spirituality that embraces the whole of creation. It reminds us that the Earth, as our mother and common home, requires protection. In these simple words, our Holy Father is challenging us to cultivate a spiritual awareness that does not put man above all creation, rather placing ourselves at the service of God’s beautiful works. In a subsequent address to the Polish Bishops, our Holy Father focused on two pillars of the Gospel which I see as fundamental tenets for us to follow in the Order. He acknowledged that Christ’s teaching, “Verily I say unto you, inasmuch as you have done it unto one of the least of these my brethren, you have done it unto me” has to be underpinned by a genuine belief in the Beatitudes. It is, in fact, through these teachings that we promise serve God as brothers and sisters in the Order of Saint Lazarus. The hardship of Holy Week reminds us of the broken world in which we live. The joy of Easter reminds us of the hope to which our Faith and our vocation calls us. Our Blessed Lord himself reminds us that those who are truly blessed are those who share the qualities that He values; these are what make us truly noble, not the qualities valued by the world. I pray that you and your families will have a blessed Eastertide and go forth with new hope. On 16-18th March, members and postulants of the Grand Priory of Bohemia had the opportunity to participate in three-day Lenten Recollections at the International Center for Spiritual Restoration in Hejnice. The tradition of Lent Recollections in Hejnice was created thanks to the efforts of two members of the Order - Miloš Raban, SChLJ and the commander of the North Bohemian delegation chev. Antonín Schauer, KCLJ, who have organized the recollections of the North Bohemian delegation in 2008 (Miloš Raban died 2011, Antonín Schauer died 2017). 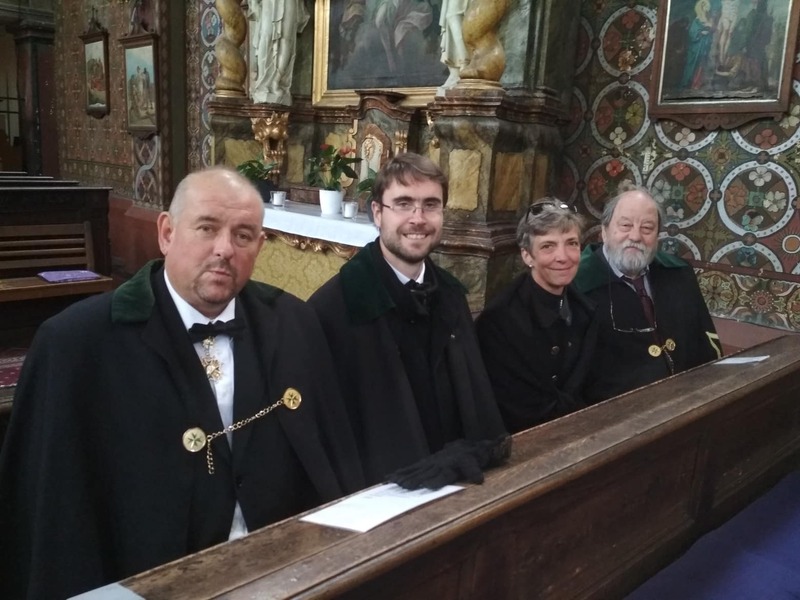 This year, the 10th recollections for members of the Grand Priory of Bohemia was held in Hejnice. 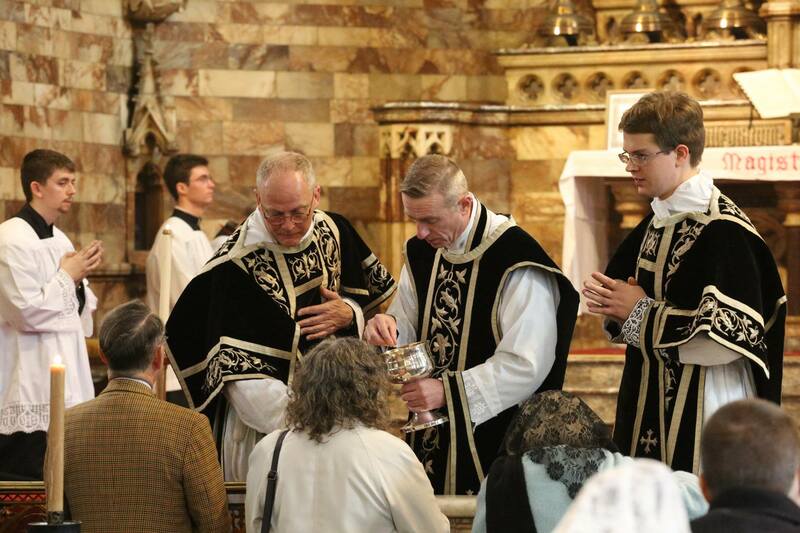 The programme began on Friday afternoon with the dedication of the cross-way in the cloister of the Basilica. The main block of lectures was held on the second day by P. Milan Badal, ECLJ, secretary of the cardinal Dominik Duka. 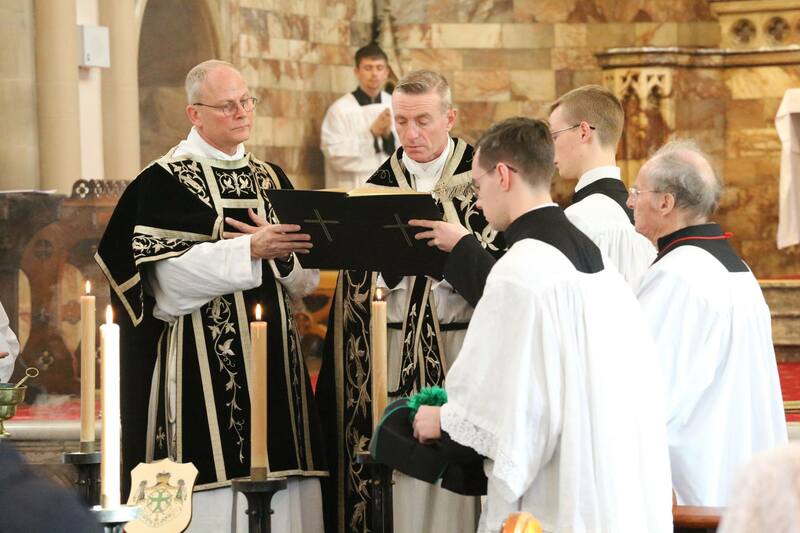 Invitation to the upcoming investiture of the Grand Priory of the USA. 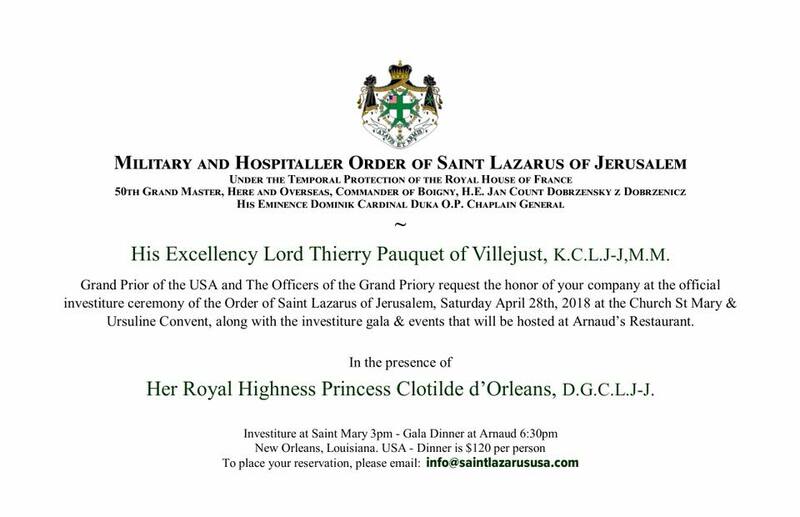 His Excellency Lord Thierry Pauquet of Villejust, KCLJ-J, M.M., Grand Prior of the USA and The Officers of the Grand Priory request the honor of your company at the official investiture ceremony of the Order of Saint Lazarus of Jerusalem, Saturday April 28th, 2018 at the Church St Mary & Ursuline Convent, along with the investiture gala & events that will be hosted at Arnaud´s Restaurant. 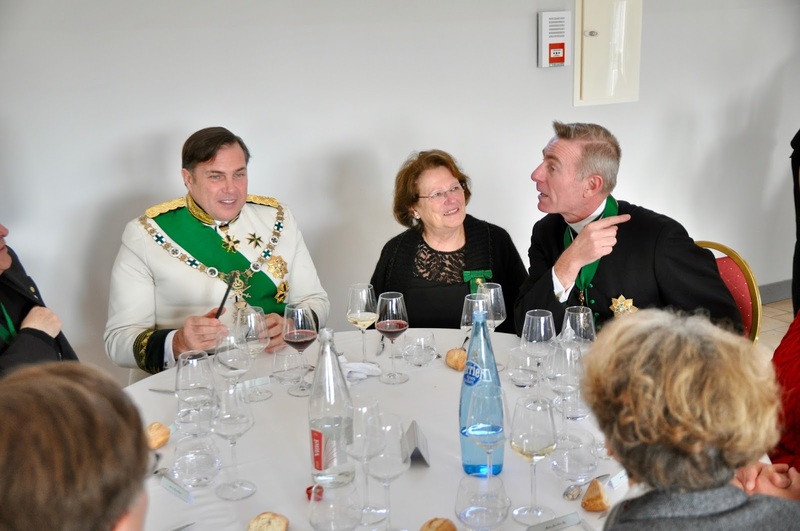 In the presence of Her Royal Highness Princess Clotilde d´Orleans, DGCLJ-J. Investiture at Saint Mary 3pm - Gala Dinner at Arnaud 6:30pm, New Orleans, Lousiana. USA - Dinner is 120 dollars per person. To place your reservation, please email: info@saintlazarususa.com. 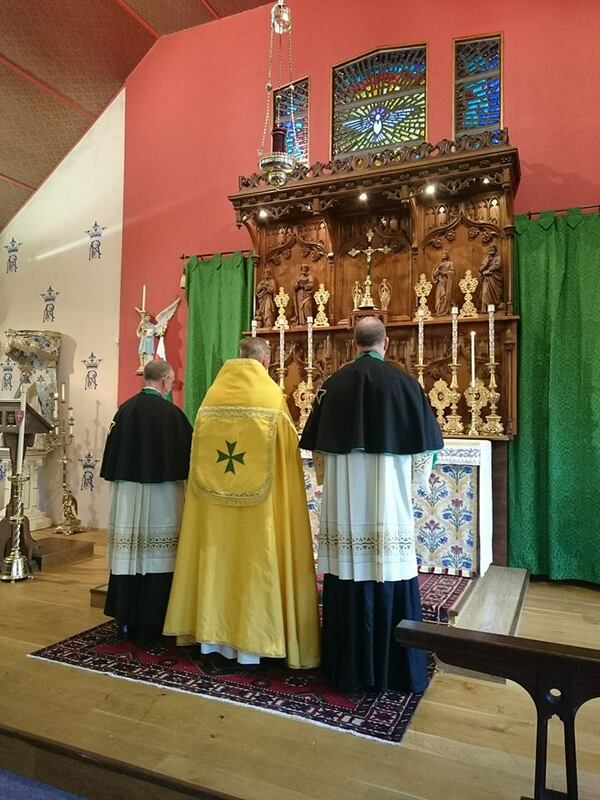 In Rougemont, Switzerland, a ceremonial mass was held on the occasion of the reactivation of the Grand Priory of Switzerland. On that occasion, the Grand Master made an act of admission and promotion. Celebrations were honored by the presence of several royal and diplomatic figures. 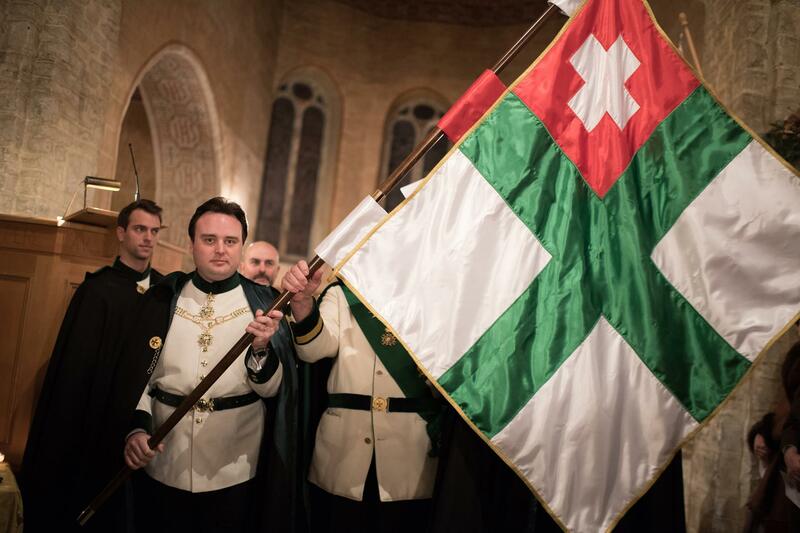 A charity dinner followed in favor of the Grand Priory of Switzerland. 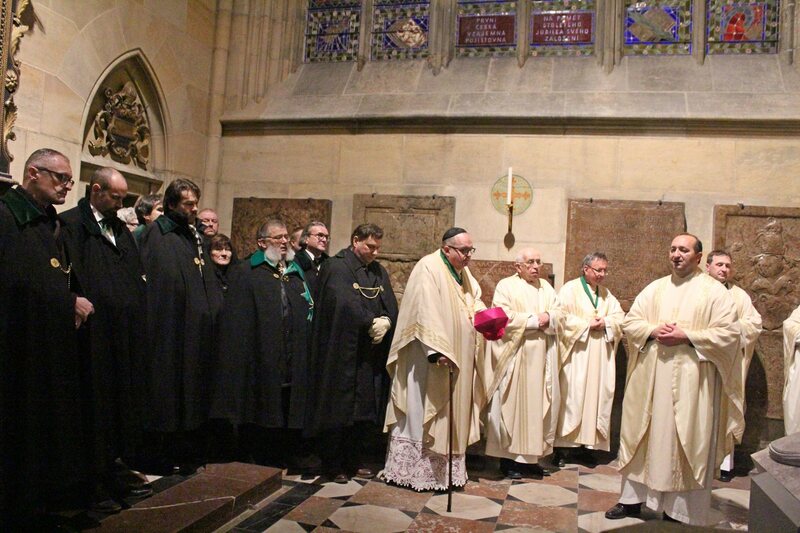 The February meeting of the Commandery Prague of the Grand Priory of Bohemia took place at the beginning of the Lent. The meeting began with Holy Mass in the Church of the Assumption of Virgin Mary and St. Charles the Great in Prague. Then they all remembered the third anniversary of the Apolinář Clinic. 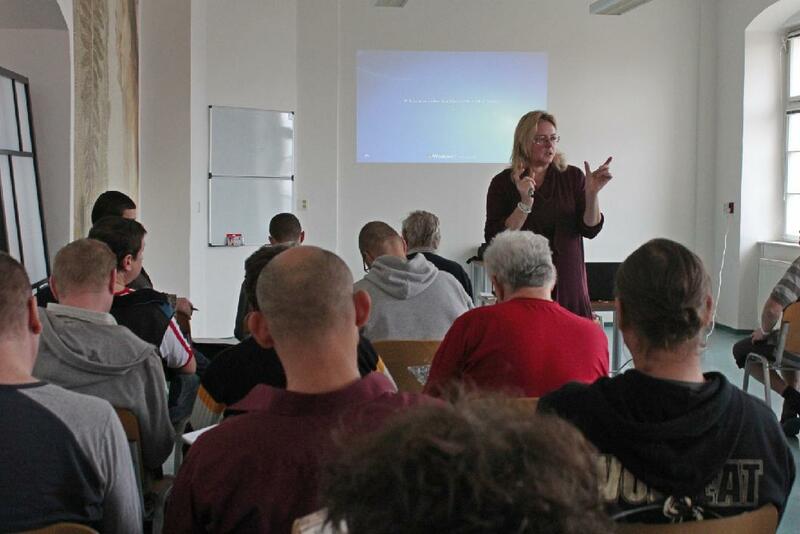 This clinic provides free legal advice to clients of the Addictology clinic of the General University Hospital in Prague. The counseling activity was reviewed by csr. Lenka Šalamoun, SBLJ and it outlined the plans for the future. The guest Mgr. Martin Vlček, therapist of the Addictology clinic, thanked for all the work of the Apolinář Clinic. 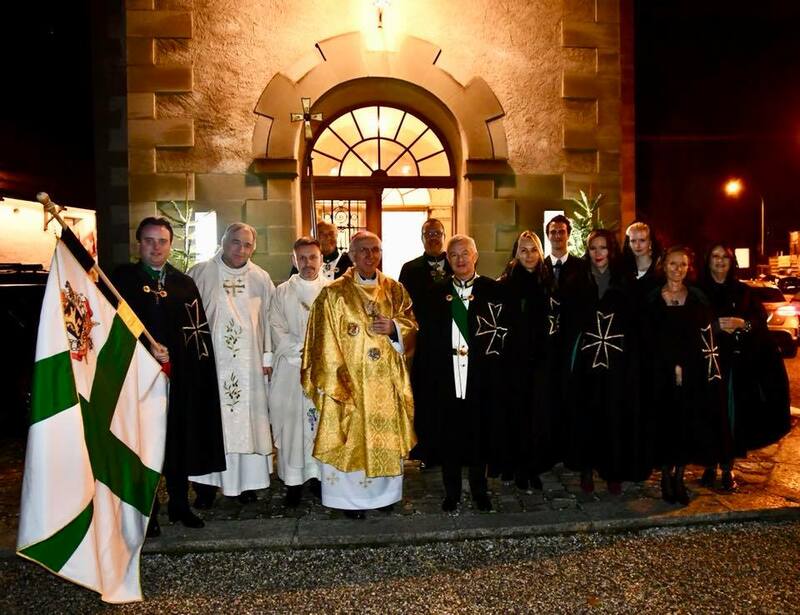 Mass, investiture and promotions of new members of the Swiss Commandery was celebrated by Mons. Waclaw Depo, Archbishop of the Czestochowa, and by Mons. Slawomir Kawecki, priest of the Collonge-Bellerive, in Geneva. One of our former members, Cons Jean Yates, dies today (13th January 2018) after a short illness. 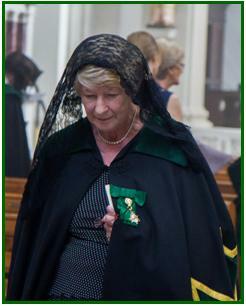 She was a devoted servant of Holy Mother Church. May God grant her eternal rest and comfort her family at this time. 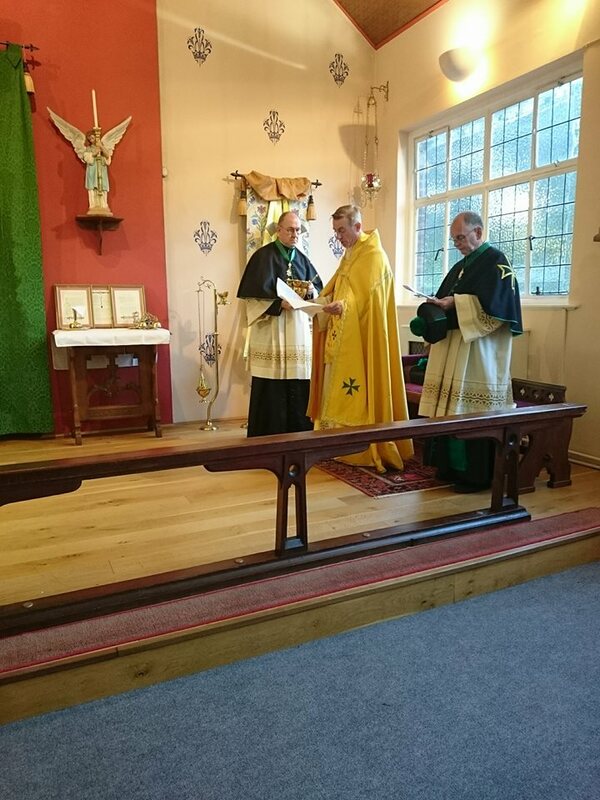 Grand Priory of Bohemia celebrated St. Basil the Great, Patron Saint of the Order, during the Holy Mass on 9th January 2018. 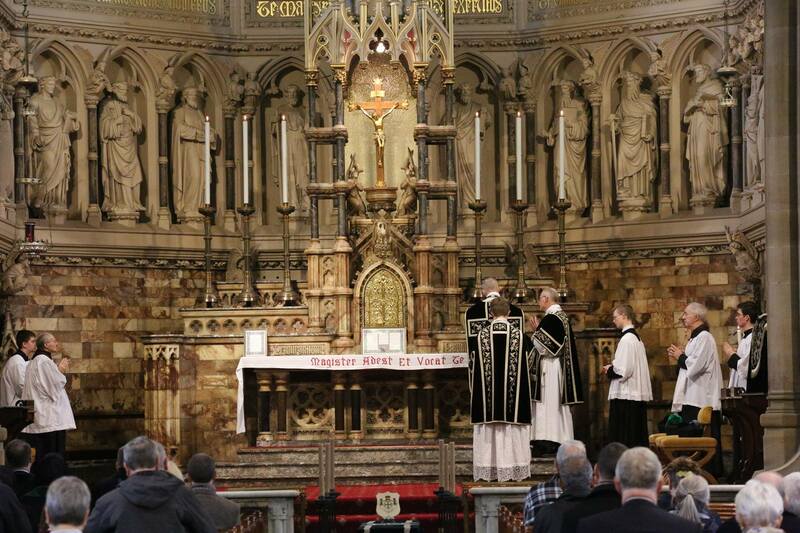 Mass was celebrated by R. D. Pavel Porochnavec, ECLJ, at St. Wenceslas Cathedral in Prague. Homily from His Grace Mons. Jiří Hladík, ECLJ. After the Christian forces were expelled from the Holy Land, Boigny was the first commandery given to the Order of St Lazarus in France by King Philip IV in 1308. The chateau, church and lands, though no longer in the possession of the Order, still bear those historical links. The Grand Priory of France celebrated here the feast of St. Lazarus, main Patron Saint of the Order, in December 2017. The Order´s day of the Grand Priory of Bohemia was held in Prague (9th December 2017) with the participation of the Grandmaster of the Order, Jan Count Dobrzenský and Chaplain General, Dominik Cardinal Duka, Archbishop of Prague. 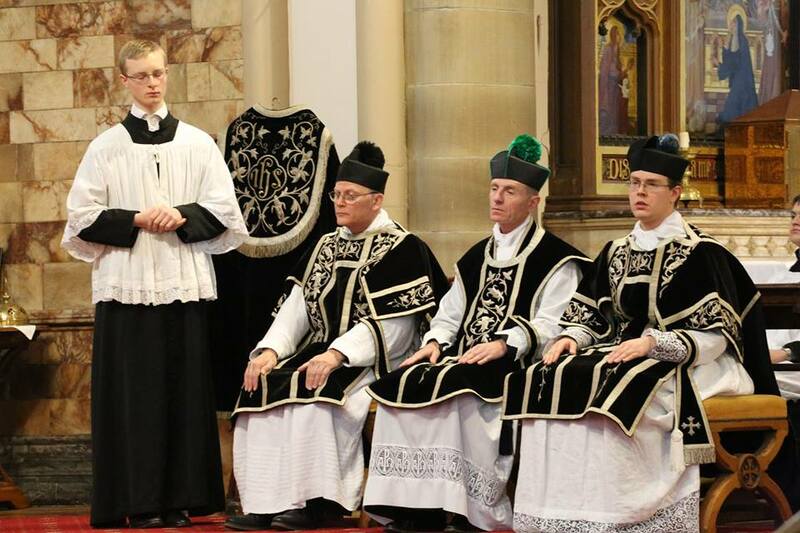 Order´s day were also a commemoration of the 80th anniversary of the Grand Priory of Bohemia. 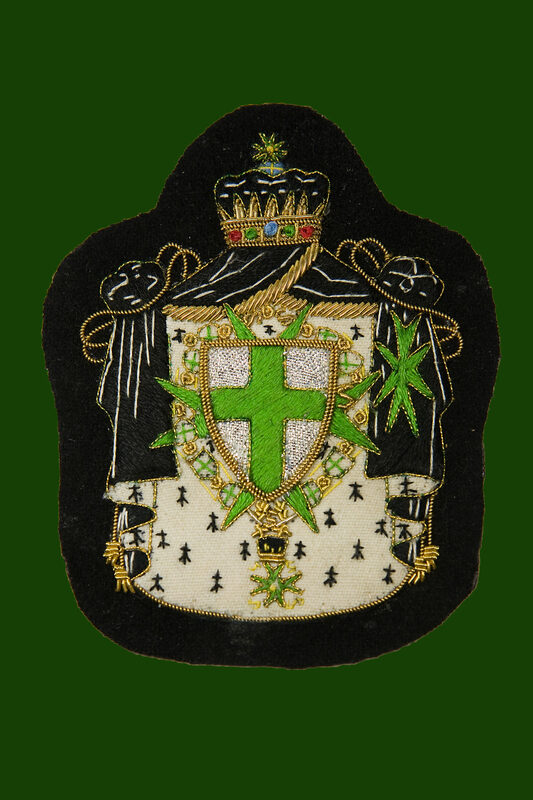 Grand Priory of Bohemia was founded in 1937 by Charles VI. Prince Schwarzenberg. Also the most important charity activities (support for Children Mental Hospital in Opařany, counseling "Apolinář"...) were presented to guests during the Order's day. I will miss you tremendously. You have been a wonderful friend, the most noblessny a gentleman could have been ,and an example to all as a Knight of Saint Lazarus. Your Christian Qualities in the defense of our cause to the sick, the poor, and the needless has always been upheld by you, Antonin. as your personal Credo. And that peaceful and smiling face. The sunshine of The Grand Priory of Bohemia. We will all miss you but we will never forget you. Here on earth, we pray for your soul. Without a doubt the place reserved for you alongside the Almighty is the best compensation for this accomplished life on this earth. May you look down upon us and continue to guide your Friends and Brothers from The Grand Priory of Bohemia. 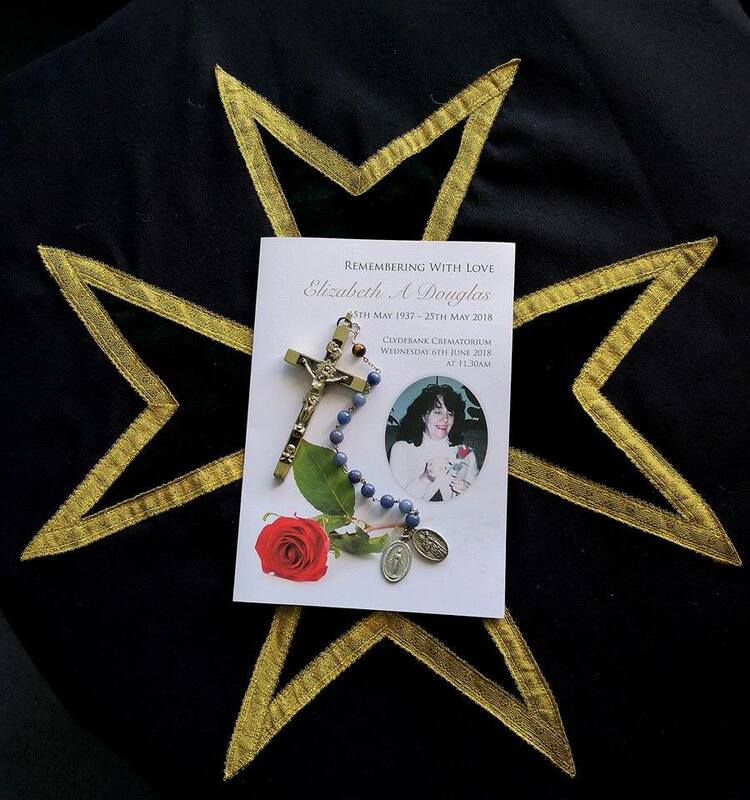 And to Radka and your family we shall care to honour your memory with our prayers. Yes, my Dear Antonin, this is not an eternal goodbye but only a short goodday from all your friends who send you their brotherly love. May you rest in peace from your friend and Brother Jenda. Solemn High Mass of Requiem with the Fauré setting sung by the Octavius Singers today (18th November) at English Martyrs Church, Preston. 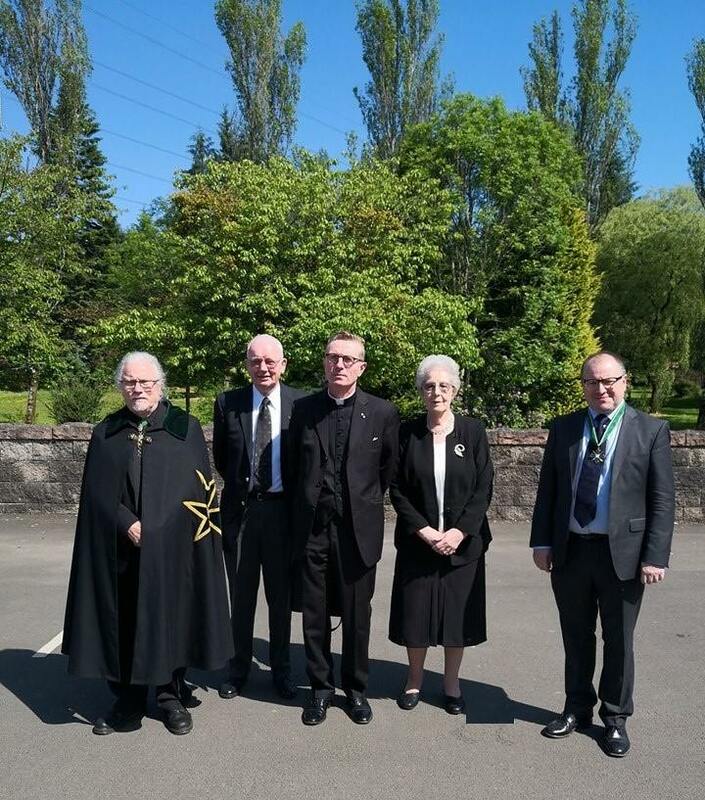 There were very happy to welcome Father Simon Henry for this Requiem for the deceased members of the Order. Brussels was the setting for the annual meeting of the Chapter of the Governing Council this year, hosted by the Grand Priory of Belgium and Luxemburg. Following on from the business meetings, where we heard reports of the great charitable work being done by members of the Order throughout the world, members gathered in the beautiful church of St Nicholas in the heart of Brussels for Holy Mass and the investiture of new members, as well as promotions. 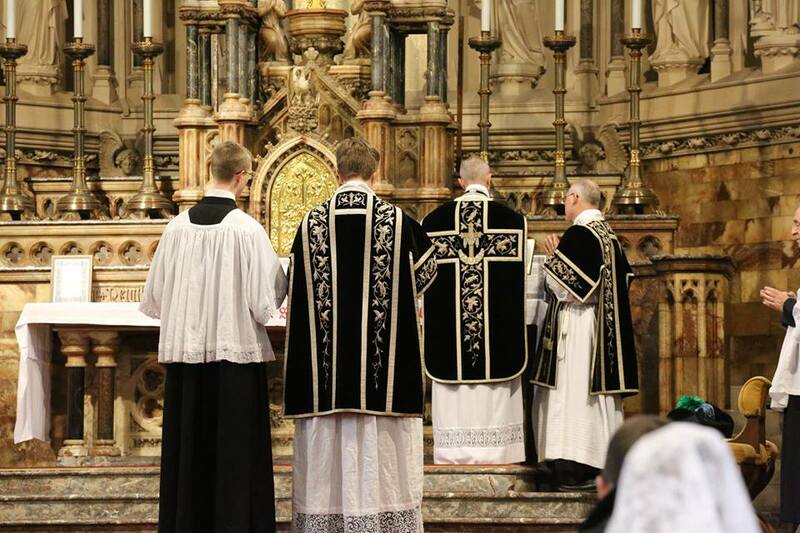 It will be Solemn Mass in the Traditional Form. for allowing welcoming us to their church. 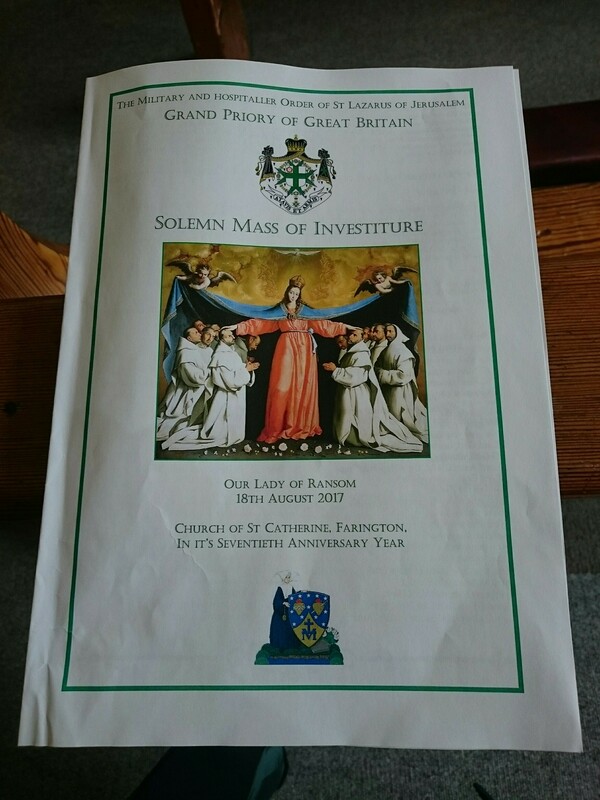 19th August 2017, the Grand Priory of Great Britain held the annual Solemn Mass of Investiture at the conventual church of St Catherine Labourè in Farington Lancashire. 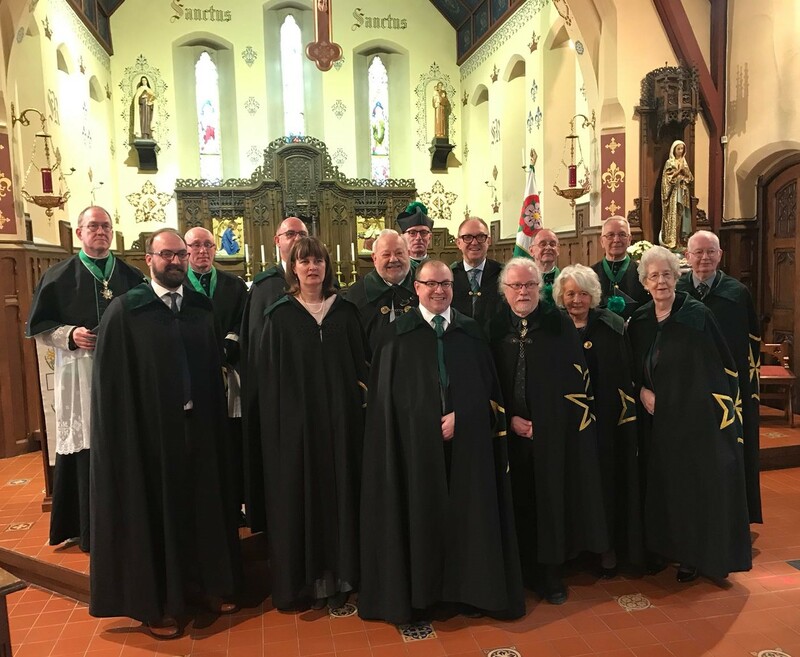 The Grand Prior HE The Baron Fetternear assisted by the Grand Priory Chaplain General Fr Simon Henry and The Grand Priory Chancellor Fr Mark Lawler promoted members within the Order and the Order of Merit. 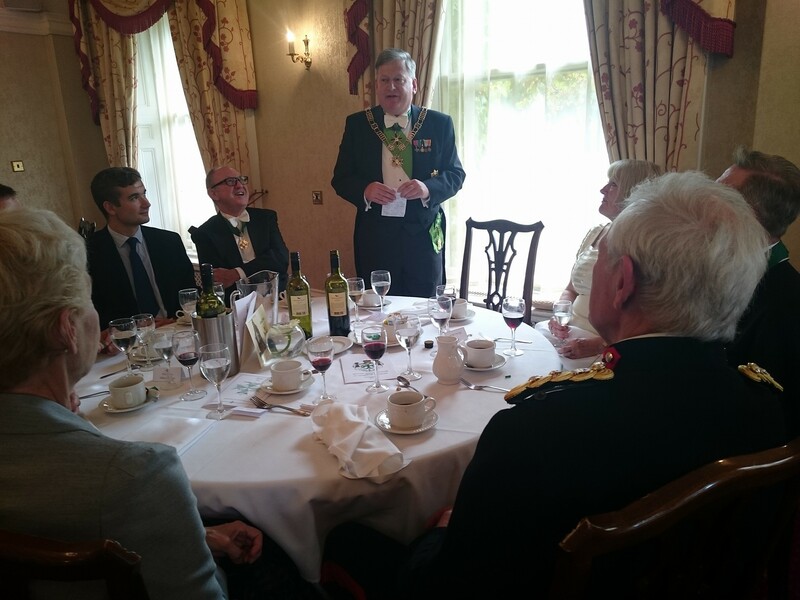 The special guest of honour was the Vice Lord Lieutenant of Lancashire Colonel Alan Jolley . Andrew McDermot from Brother to Serving Brother. Brian Williamson from Brother to Chevalier(Knight). 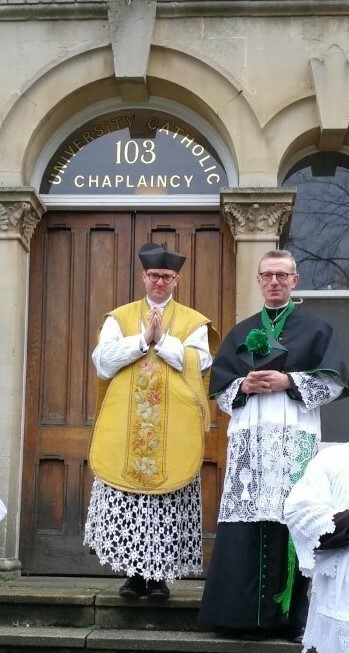 Rev Fr William Charlton to Senior Chaplain. 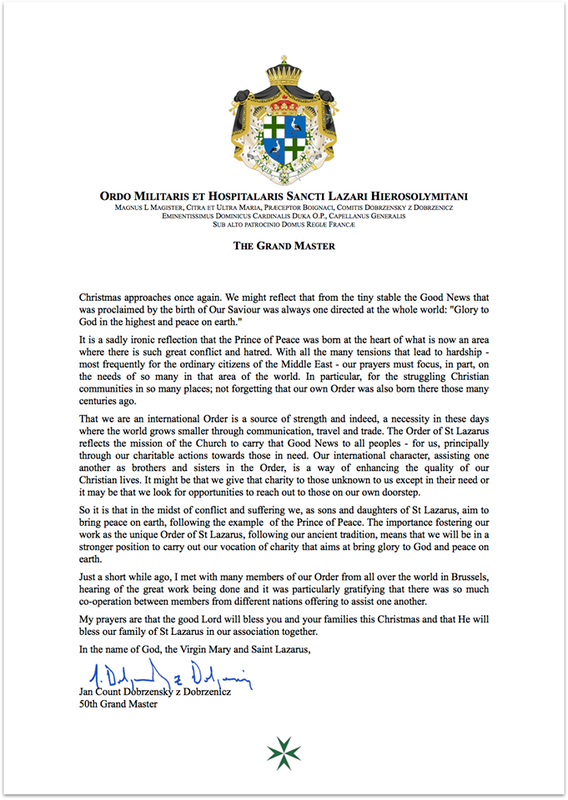 Senior Chaplain and the Grand Priory Chancellor, the Rev Fr.Mark Lawler and Chevalier William Hackett ,the Grand Priory Hospitaller , were both created Commanders in the Order of Merit for their service to the Order of St Lazarus both here and Internationally. 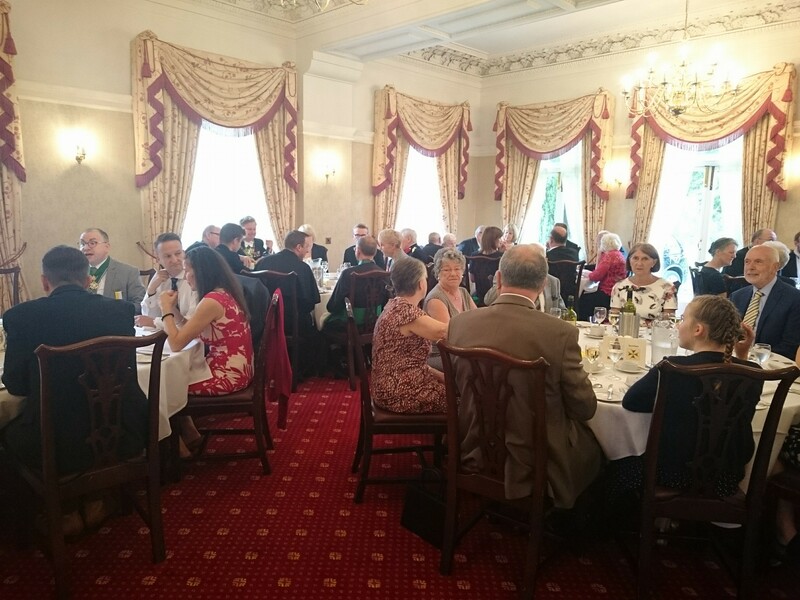 A celebration luncheon was held after the Solemn Mass of Investiture by the Grand Priory of Great Britain. 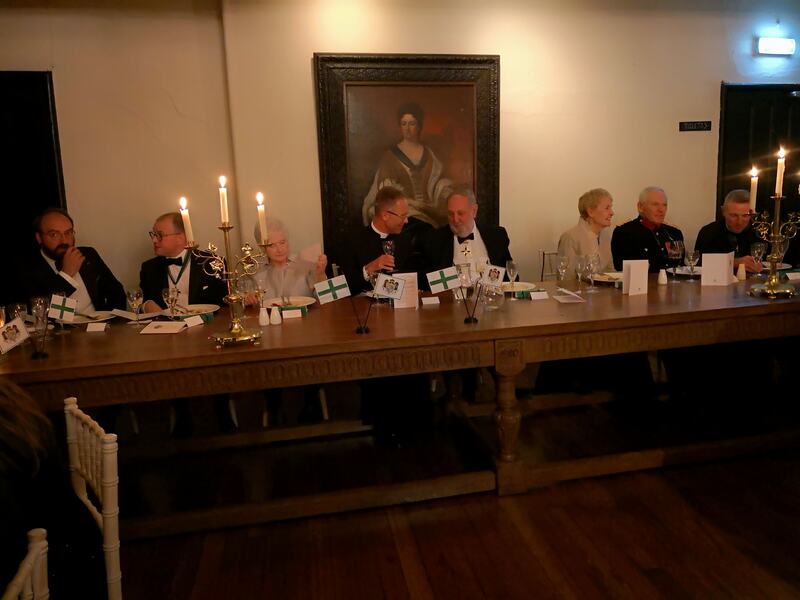 This was hosted by the Grand Prior HE The Much Honoured Baron Fetternear. 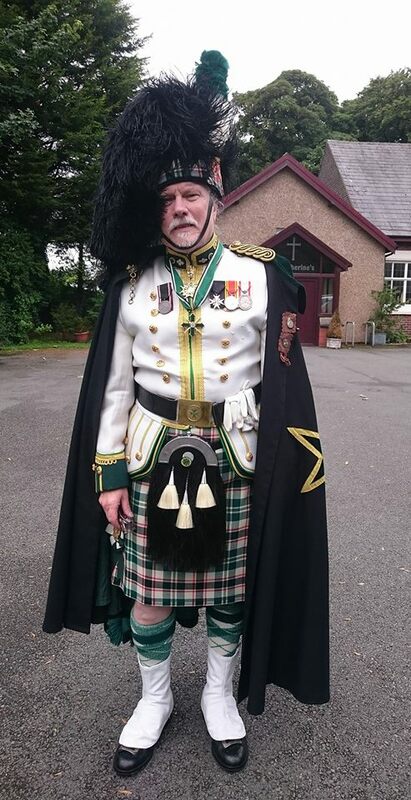 The special guest of honour was the Vice Lord Lieutenant of Lanashire Colonel and Mrs Alan Jolley. 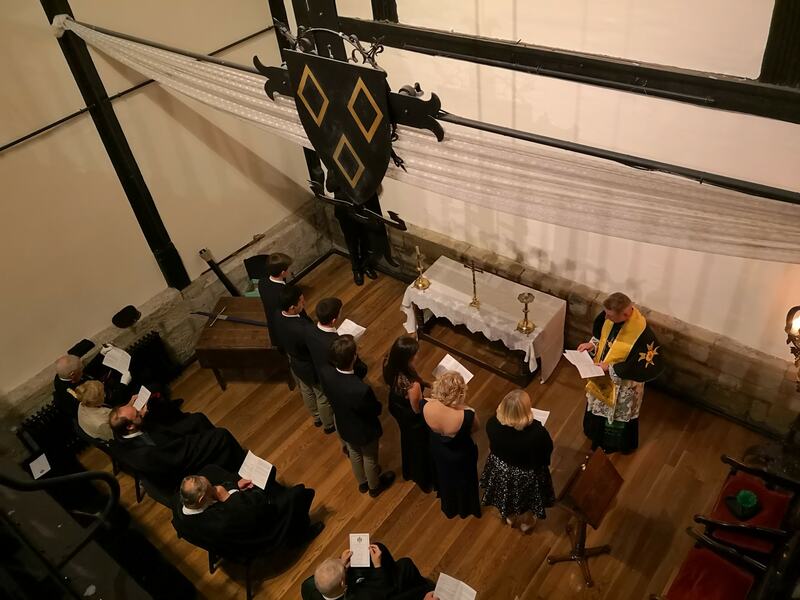 The annual Vigil Service for the Grand Priory of Great Britain was held last night (Friday 18th August) in the conventual church of St Catherine Labourè,Farington Lancashire. 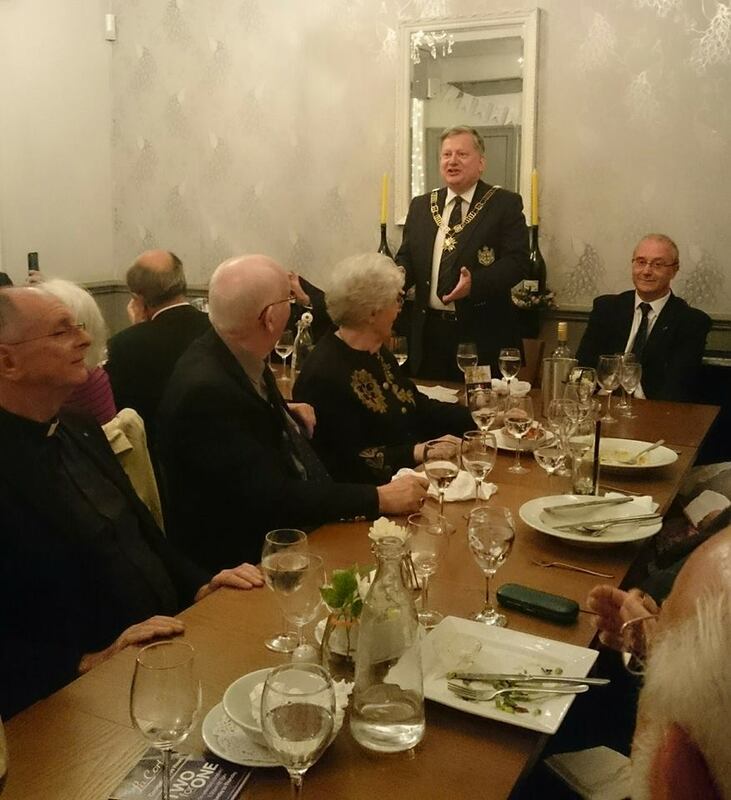 Members of the Grand Priory renewed their vows and afterwards had supper in a local restaurant. 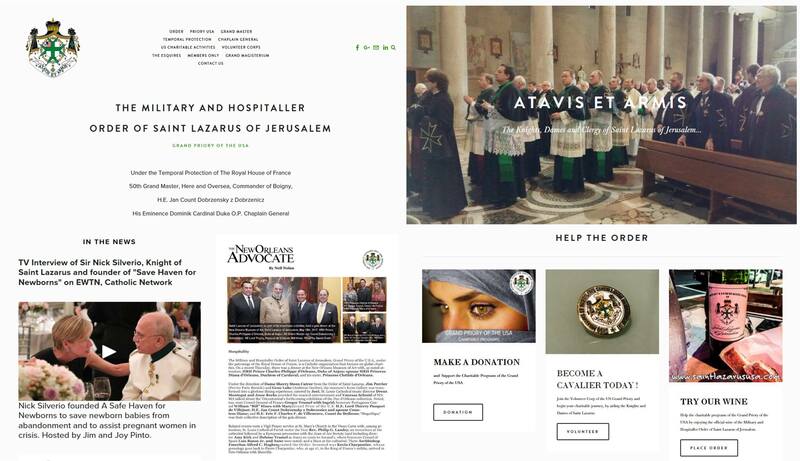 Please visit the New website of the Grand Priory of the USA ! 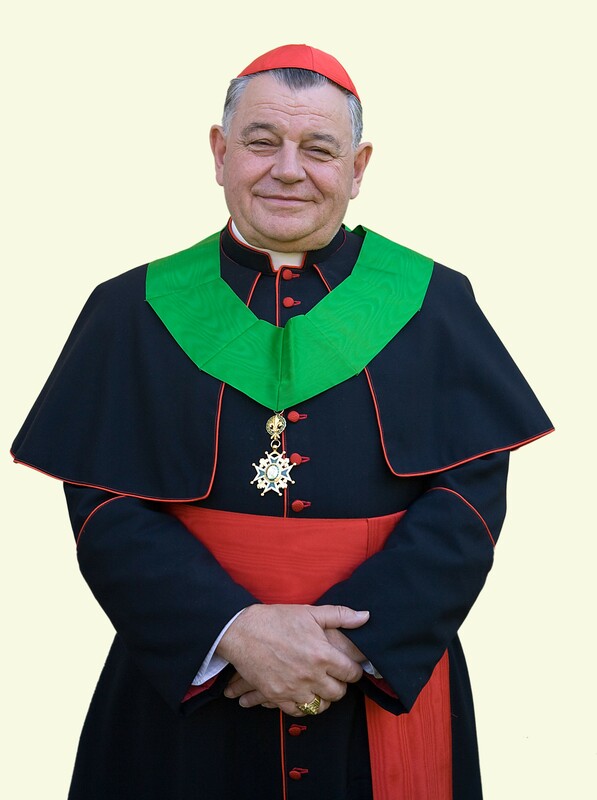 The annual Chapter of the Grand Priory of Monaco took place on 10th June at Castelet in the presence of Monsignor Dominique Rey, Bishop of Fréjus-Toulon. Also present were HE Count Jan Dobrzenskÿ z Dobrzenicz, Grand Master of Order and HE Prince Charles-Philippe d' Orléans, Duke of Anjou and Grand Master Emeritus, now Grand Prior of France and President of the Governing Council of the Order. On this occasion Archbishop Rey received the Grand Cross of the Order, becoming a Prelate Grand Cross. In addition, one new Consoeur and seven new Confreres entered the Order, whilst eight members were promoted. Thanks be to God. 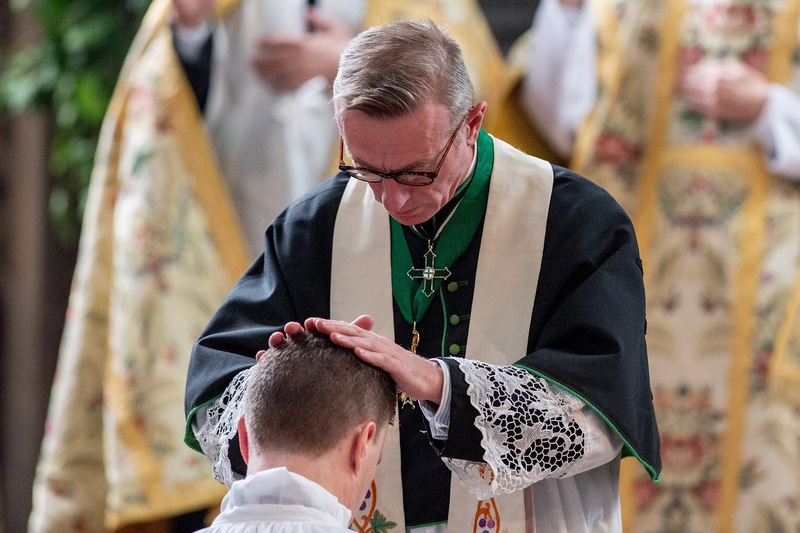 Bishop Rey is renowned far beyond his own diocese in the south of France for his forward thinking and the number of ordinations he draws to his diocese, bucking the trend of most dioceses in the western world. Also, for his support of tradition in the Church. 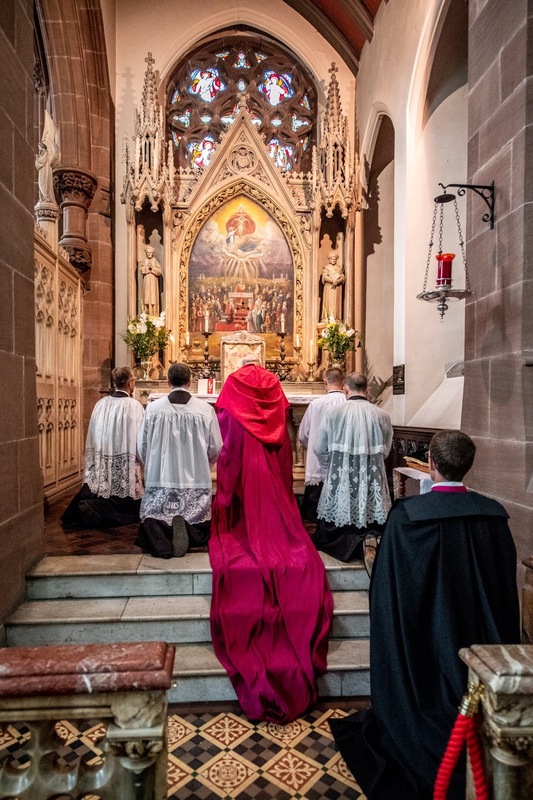 For the past several years he has been the inspiration behind an innovative Liturgical Conference - Sacra Liturgia - this year held in Milan (and previously in Rome and London). To say nothing of the annual festival of St Tropez (the Bravade), which draws thousands to take part in the three-day spectacle every year. 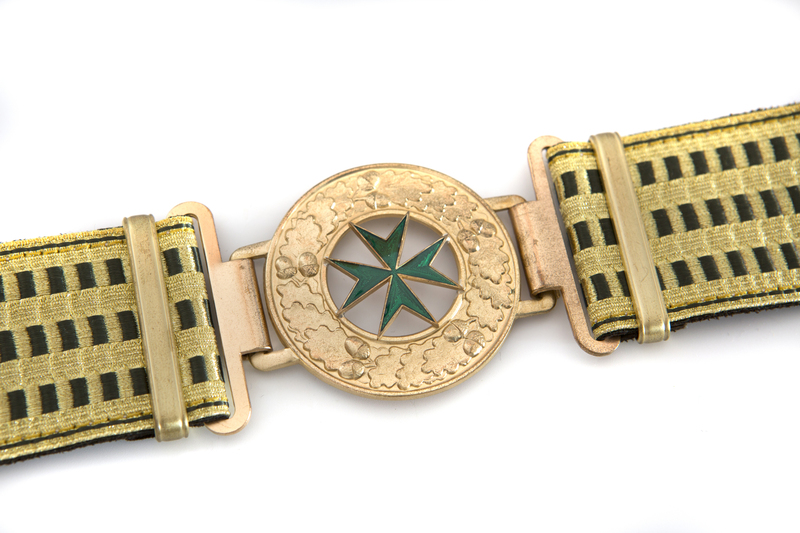 The Supreme Pontiff Francis has deigned to decree and freely bestow on the well–deserving gentleman Anthony Dickinson, a gold medal, established to recognise exemplary Christian service, granting him the faculty of being decorated with this honour. Pope Francis has recalled the 75th anniversary of the Lidice massacre at the hands of the Nazi regime during his weekly General Audience on Wednesday. 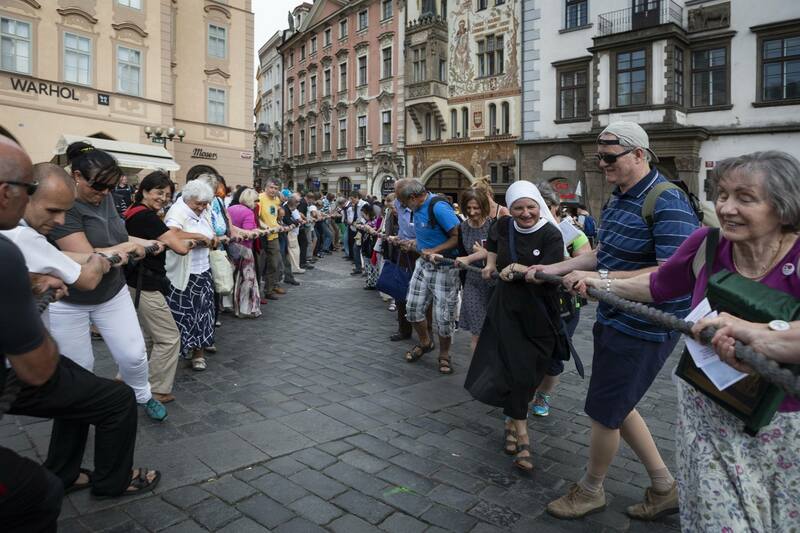 In a special Czech-language greeting to pilgrims in St. Peter’s Square, the Holy Father invited them to rely “with trust on the intercession of the Holy Virgin, whom you venerate in the icon of the Madonna of Lidice”. He prayed Our Lady help them “to be courageous witnesses of the Resurrection of Christ, especially in difficult or trying moments”. 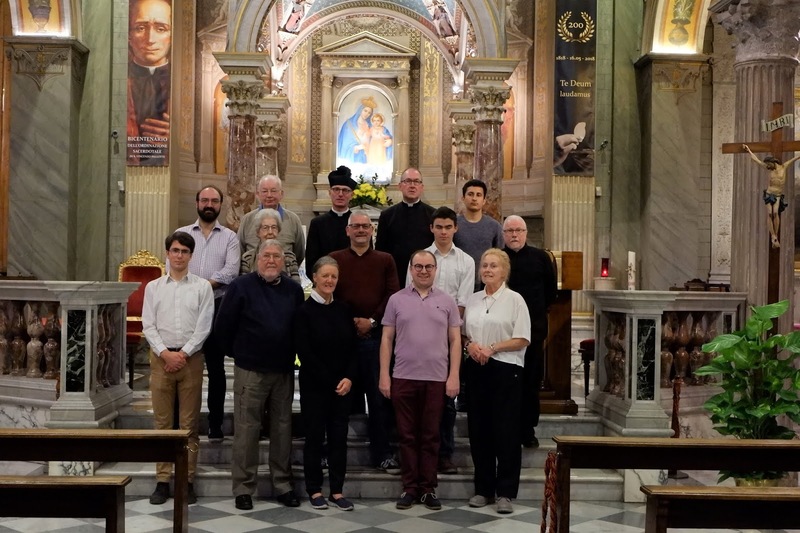 The group is participating in a national pilgrimage being led by Cardinal Dominik Duka, Archbishop of Prague and Chaplain General of the Order of Saint Lazarus of Jerusalem, which brought the icon to Rome. 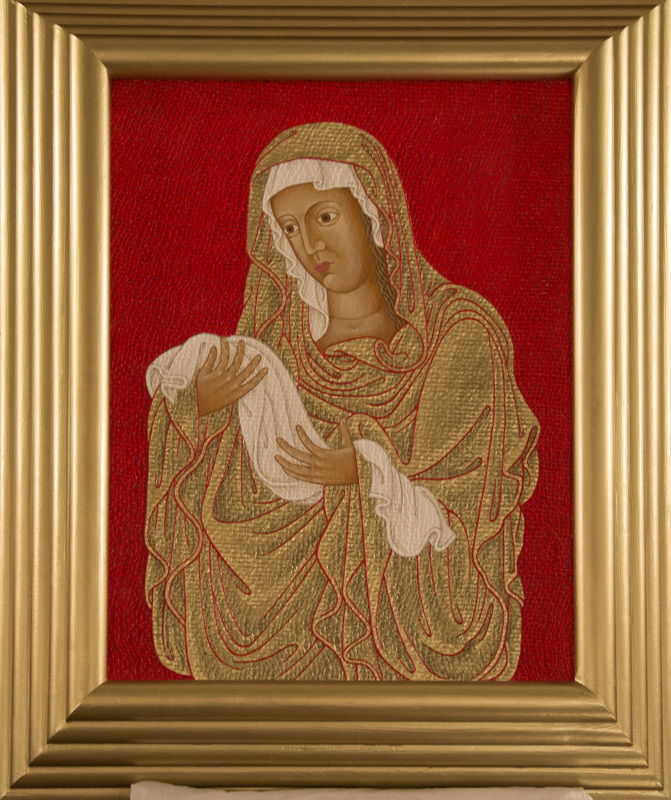 Icon of the Madonna of Lidice was hand-painted by Chevalier Zdirad Čech and from 1th June 2017 is located in Church of Saint Marcellinus and Peter. This church is titular church of cardinal Duka. *The village of Lidice (then in the Protectorate of Bohemia and Moravia and now in the Czech Republic) was completely destroyed by Nazi troops in 1942. 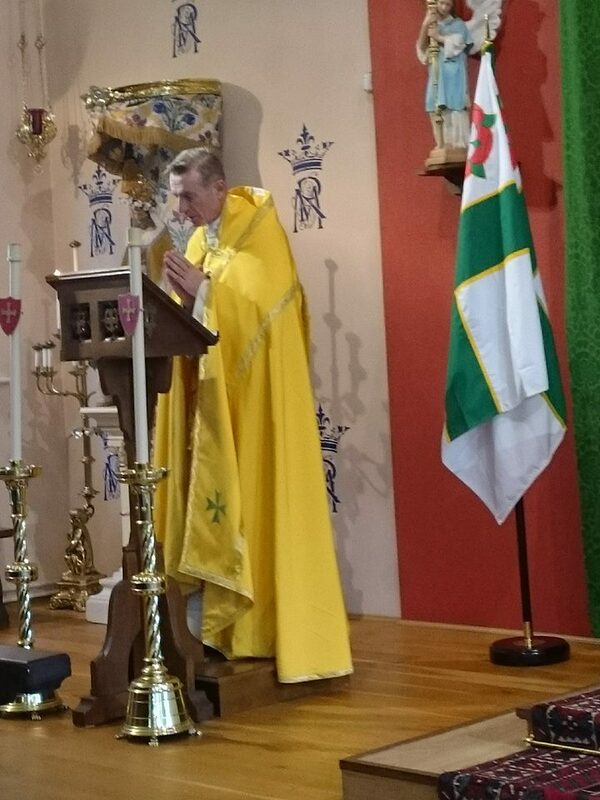 Cardinal Duka, Chaplain General of the Order, led the celebrations for the feast of St John Nepomuk, Patron Saint of Prague, last week. 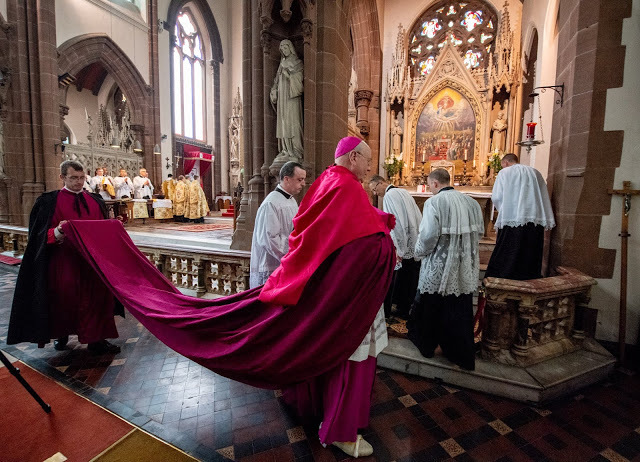 A splendid Mass in the packed Cathedral celebrated by the Cardinal, who was joined by the Papal Nuncio, Archbishop Giuseppe Leanza with about forty priests in attendance, many seminarians, members of the Order and Chaplain General from Great Britain, Fr Simon Henry as well. In the morning before the Mass, Cardinal Duka received Fr Simon in his office in the Archbishops Palace for a short meeting. From May 5th till May 6th, 2017 the Order of Saint Lazarus of Jerusalem made their first pilgrimage to the Shrine of Our Lady of Częstochowa in Jasna Góra. It was organized by the Grand Priory of Poland of OSLJ. 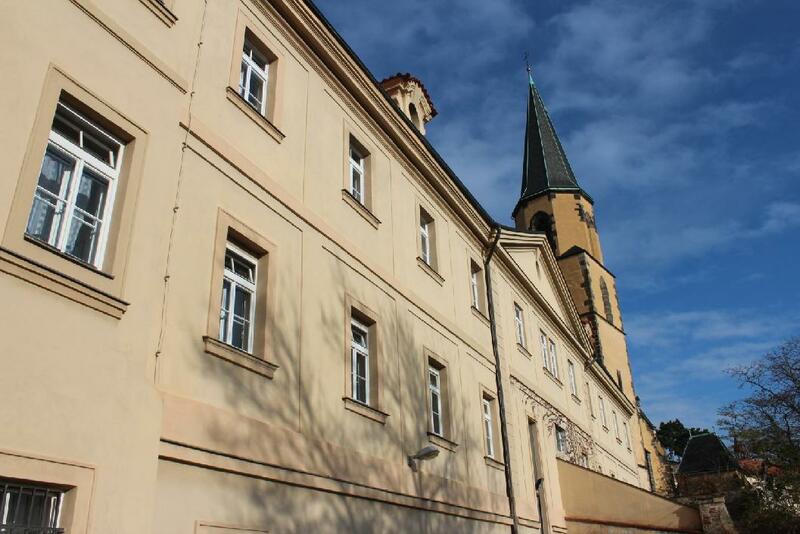 In this place – so unique for all Poles – an Investiture was also held during which four postulants were admitted to the Order: two sisters and two brothers; and promotions were received by Rev. Prelate Józef Bar and Mariusz Bieńczak from Podkarpacka Commandery as well as by Rev. Prelate Józef Kubalewski and Andrzej Mamys from Kujawsko-Pomorska Commandery. 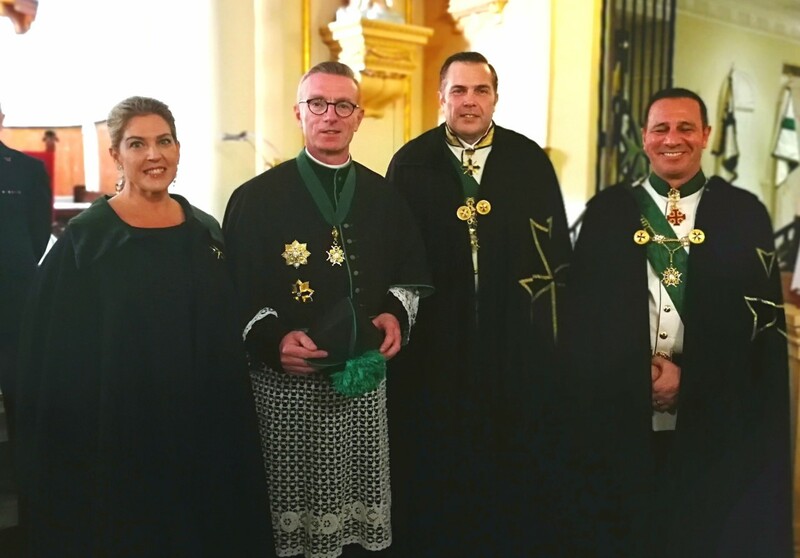 During the celebration we were honoured by the presence of the representatives of the Grand Priory of Czech Republic with the Grand Master of the Order - Jan Count Dobrzensky from Dobrzenicz, baili Ondrej Vanke and the Chancellor Petr Rehor. 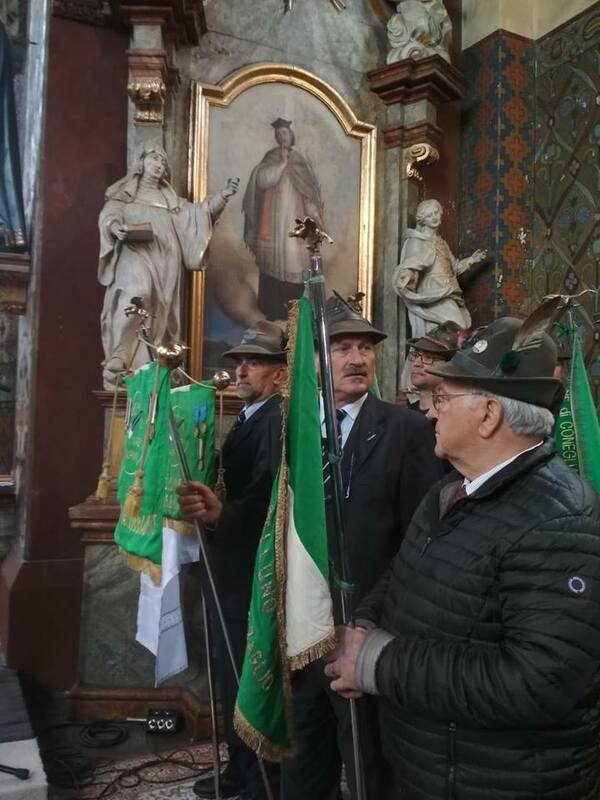 During the two – day pilgrimage there was also time to see the most precious collections of the history of the Polish nation gathered by the Puline Friars in Jasna Góra. The greatest treasure of the Marian Shrine is the Miraculous Icon of Black Madonna placed in the main altar in the Chapel of Our Lady, which already Jan Długosz himself described in Liber Beneficiorum. The Icon is surrounded by great love of all Poles and it has been receiving due veneration for ages. There was also a moment for a personal reflection and prayer before the Icon of Our Lady of Jasna Góra – the Patroness of Poland. On December 17, 2016, Bailli of the Grand Priory of Poland chevalier Krzysztof Polasik-Lipiński was appointed a Knight of the Order of St. Gregory the Great. The award was presented to him by HE. 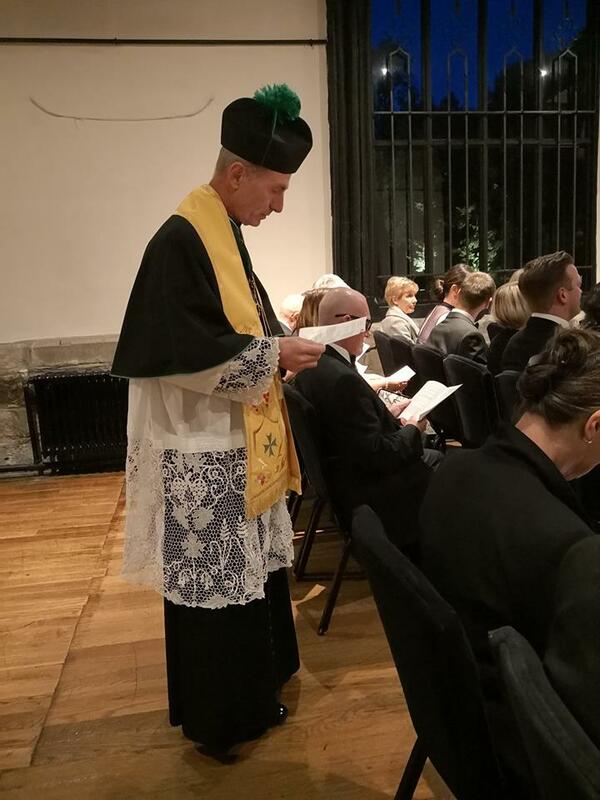 bishop Jan Tyrawa during the Holy Mass dedicated to the memory of St. Lazarus in Bydgoszcz. 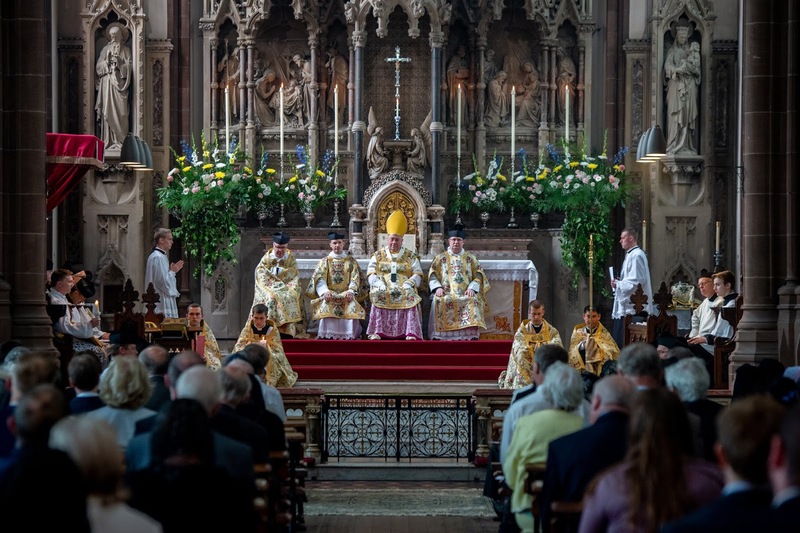 This Holy Mass was attended by church representatives and Bydgoszcz city authorities. 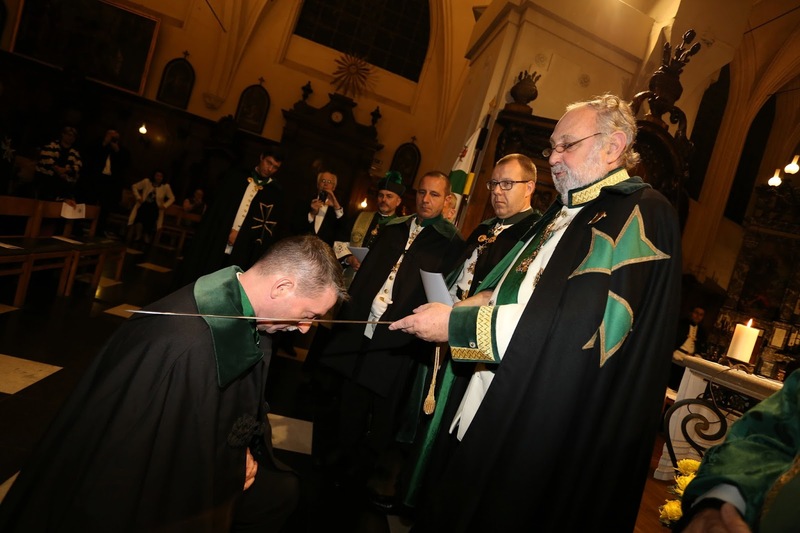 THE 50TH GRAND MASTER OF THE ORDER OF SAINT LAZARUS WAS APPOINTED A KNIGHT COMMANDER OF THE ORDER OF ST. GREGORY THE GREAT. 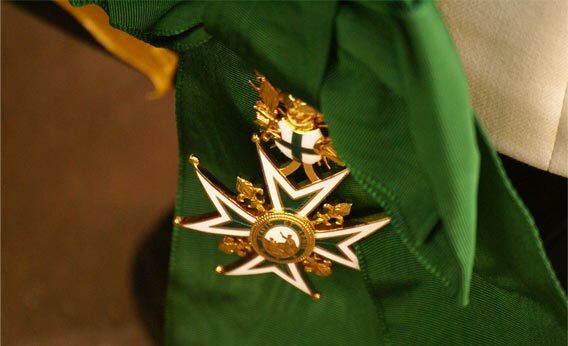 the 50th Grand Master of The Order of Saint Lazarus H. E. Jan Count Dobrzenský z Dobrzenic was appointed a Knight Commander of the Order of St. Gregory the Great. The award was presented to him by HE. 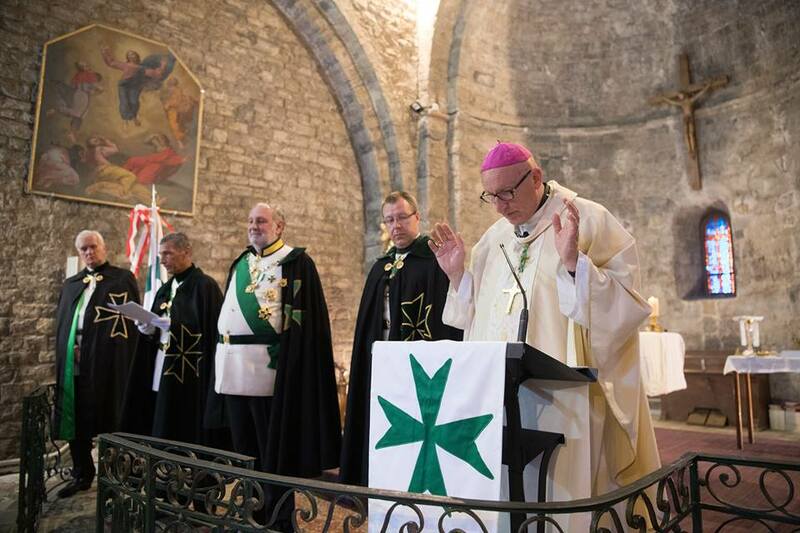 Dominik Cardinal Duka during the General Chapter of the OSLJ - Bohemia in Prague. 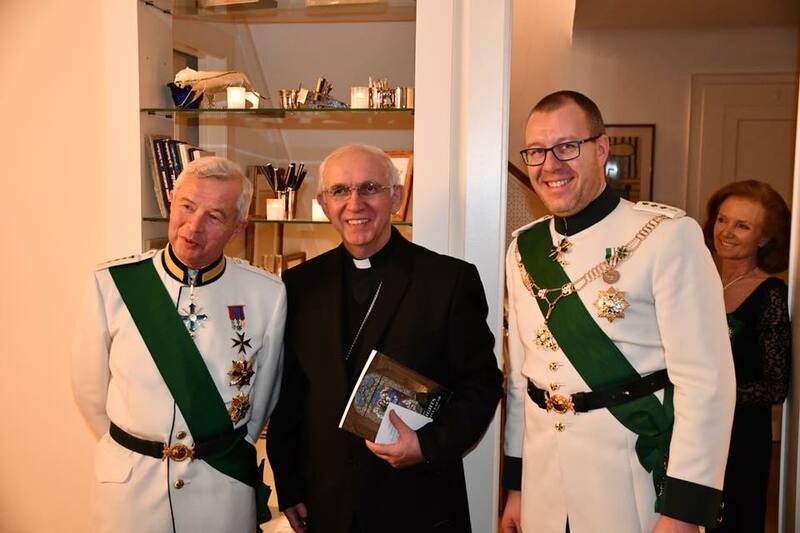 On the same occasion the Cardinal presented the Knight´s Cross of the Order of St. Sylvester to Chevalier Zdirad Čech, who is an expert and painter of European heraldry.